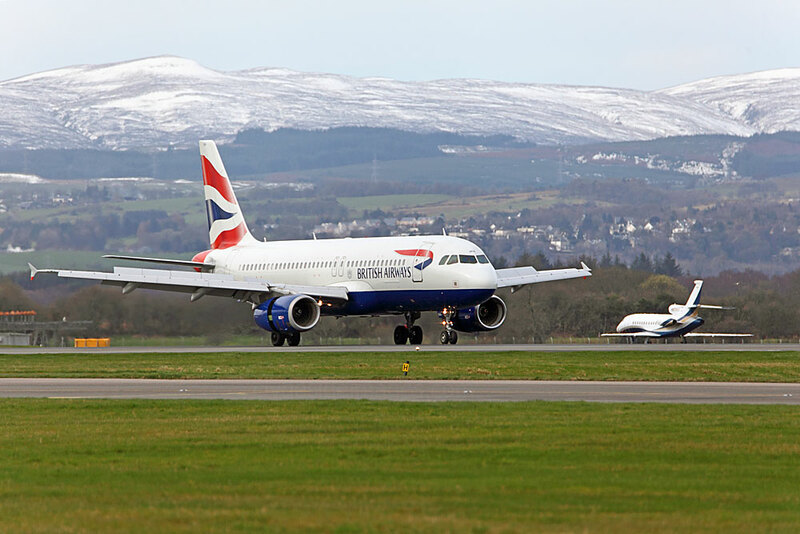 Yet again, the Glasgow International management team announced excellent passenger figures for last month with over 603,000 travellers using the airport in February. Taking into account that last year was a leap year, this represents an increase of 7.7% when compared to February 2016 and even the non-adjusted overall total of 3.3% is encouraging. 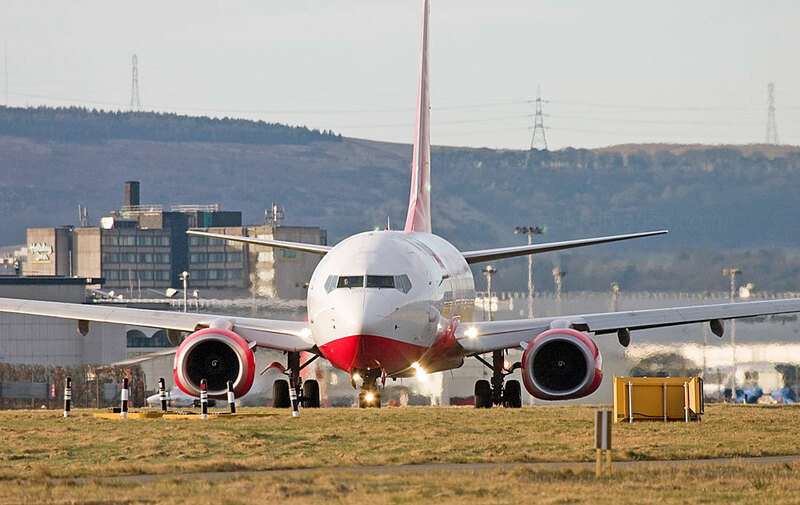 Work on the car parks and new road layout is nearing completion and the compulsory drop-off charge for motorists using the airport will be in place soon. March continued this winter`s trend by being very mild temperature-wise with the sky often overcast. 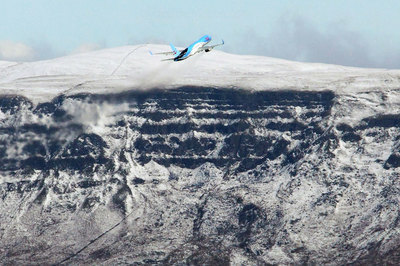 Although wintry conditions were experienced further north, there was just one occasion when a light dusting of overnight snow reached ground level here. 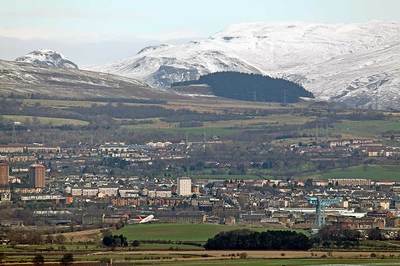 It melted quickly although the upper reaches of the hills and mountains beyond the Central belt held on to a decent covering for a time. 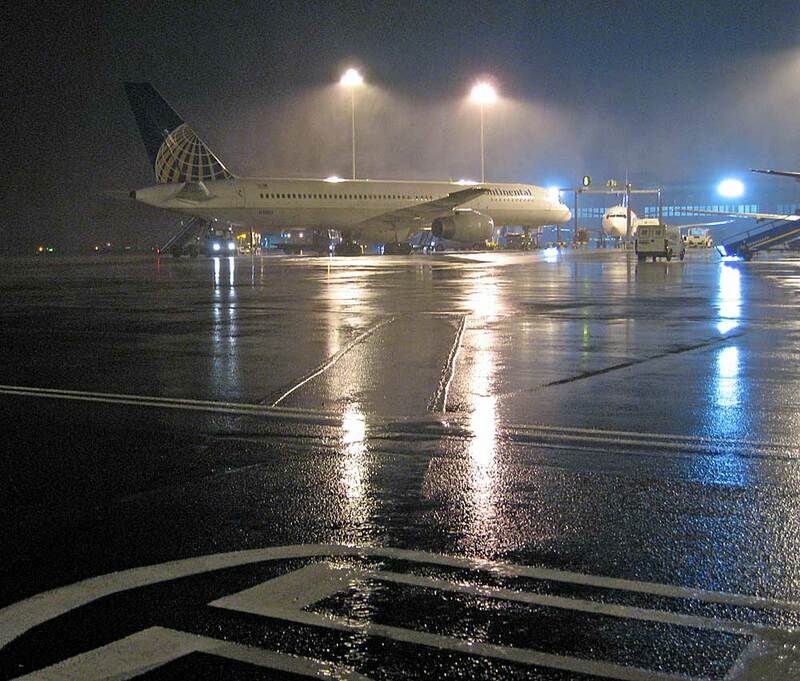 Since last November, a major runway resurfacing project has been taking place at the airport during the hours of darkness. 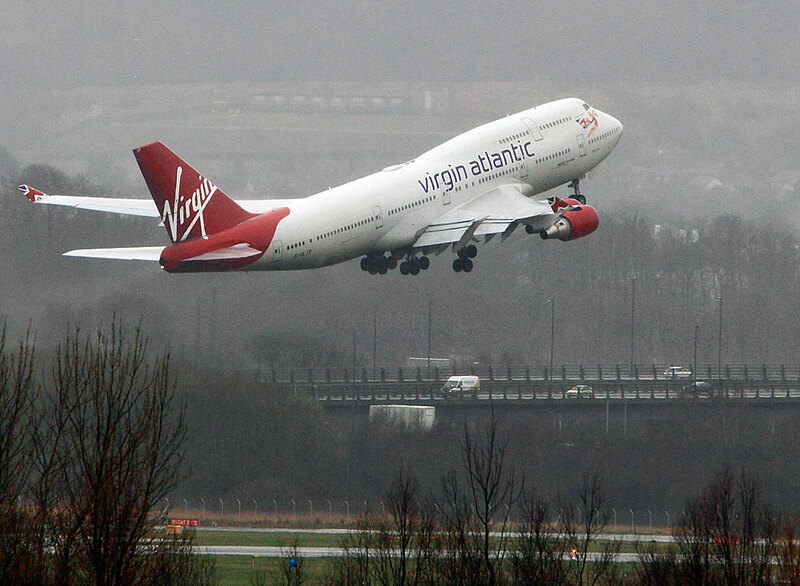 Meticulous planning over a three-year period has resulted in only minimal disruption to flights. 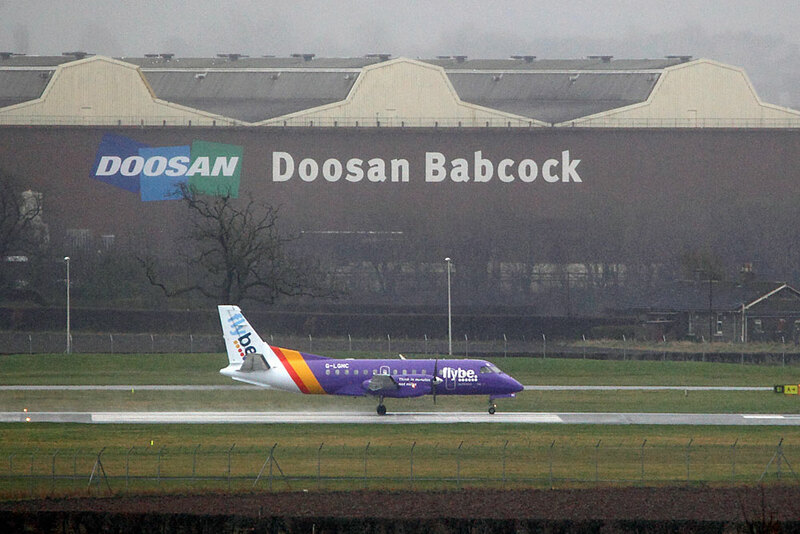 The occasional delayed aircraft missed the night time deadline and was diverted to an alternative airport. 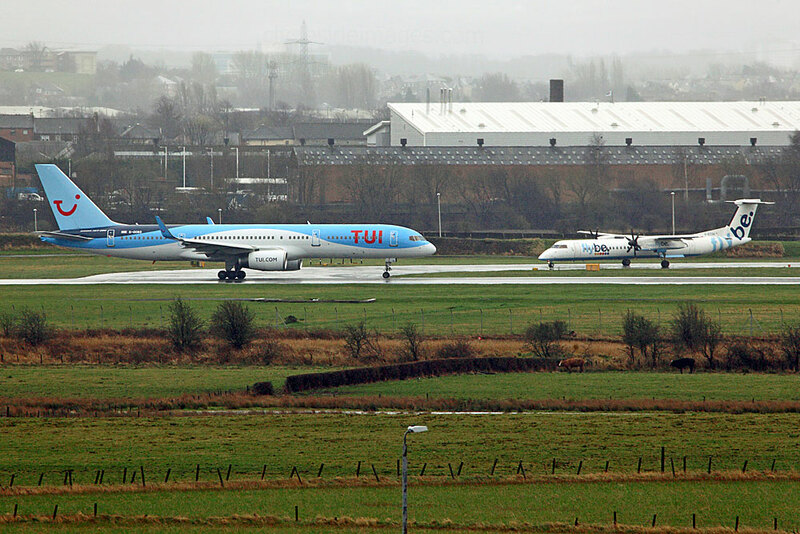 The workforce of almost 200 personnel began operations at 23:00 hrs each evening and vacated the runway in time for the airport reopening to accommodate the early morning KLM flight to Schiphol at 06:00 hrs. 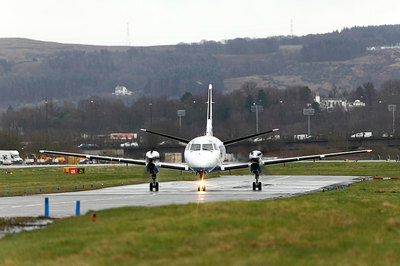 The Beech King Airs of the Scottish Ambulance Service relocated to Prestwick overnight which enabled them to remain on call for emergencies. The small army of construction workers and its collection of specialist vehicles including planers, paving machines, rollers, sweepers and converted fire engines whose high platforms now carry huge floodlights, were used to lift the old surface and lay the new hi-tech one, 120 metres at a time - weather permitting of course. 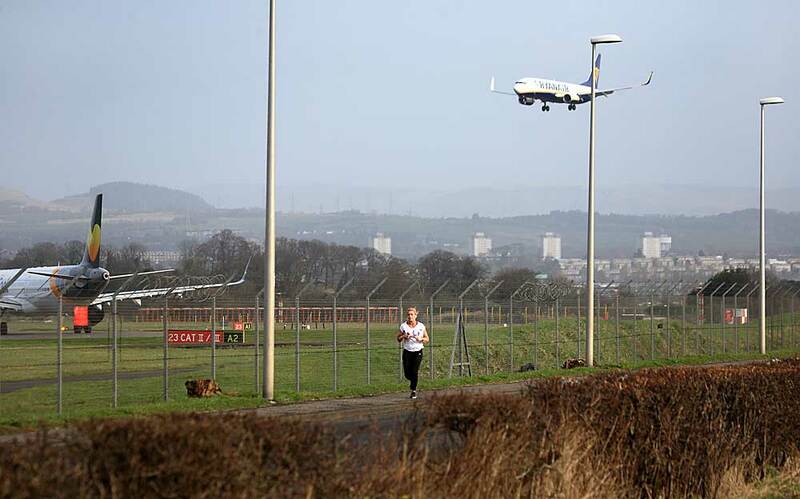 More than 200 runway and taxiway lights have also been replaced. 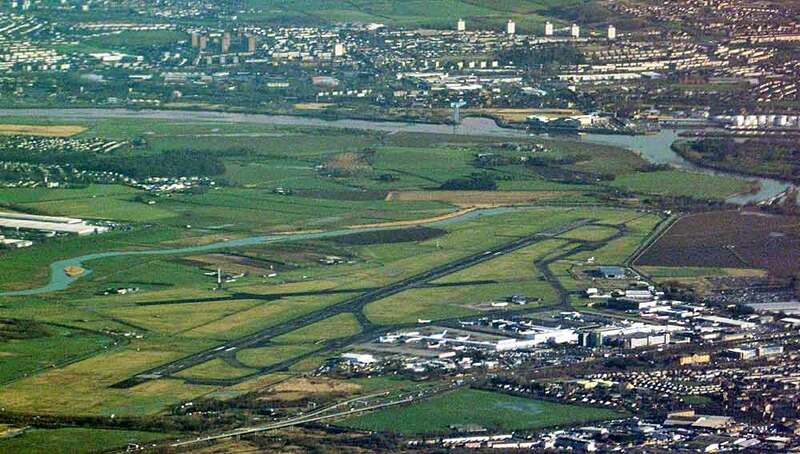 Glasgow Airport will be the first in Scotland to have a polymer modified Marshall asphalt runway that should last longer, perform better at extreme temperatures and resist rutting, cracking and fatigue. Some of the equipment used in the project was temporarily stored in this compound near the Loganair hangar. 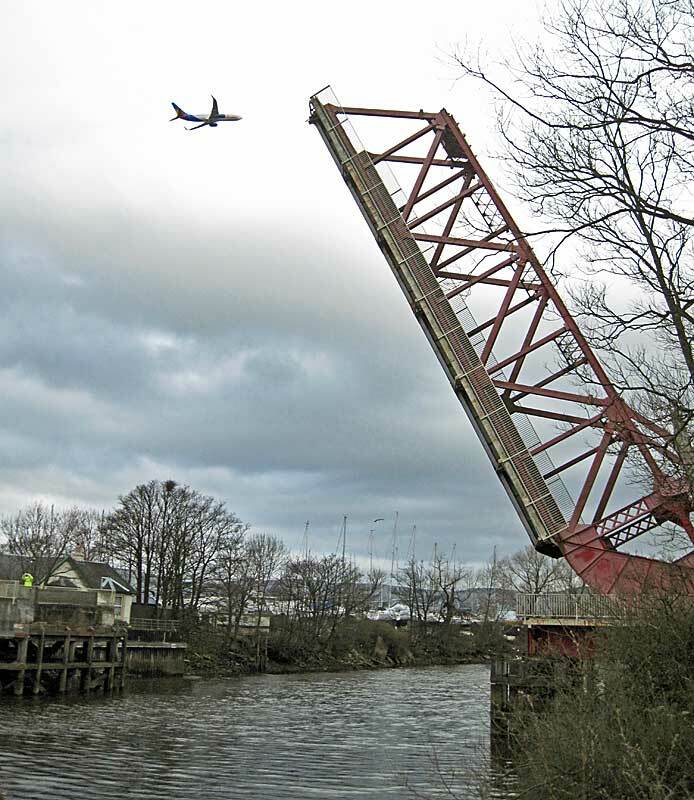 While not actually aviation-related (although I did manage to include a Jet2 737 in one of these shots), the Inchinnan bascule bridge at Renfrew will be familiar not only to locals but numerous others who have travelled to and from the airport over the years. 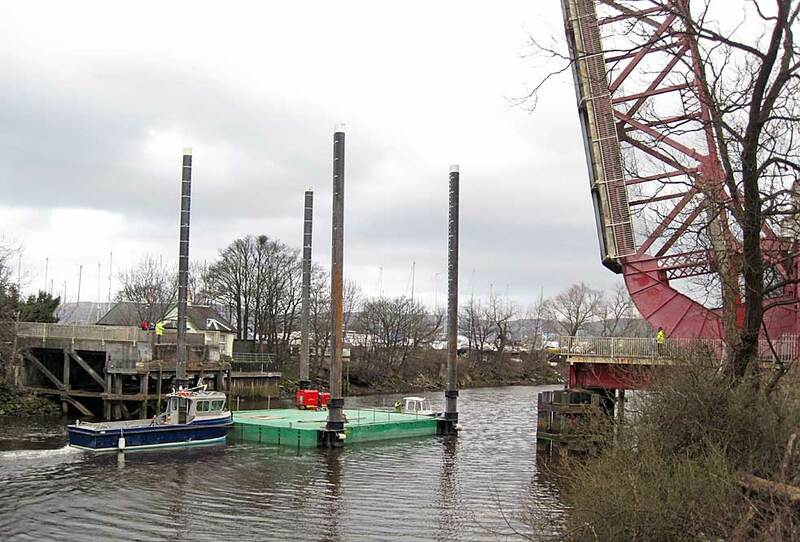 It only opens rarely, the most recent occasion being on Thursday 23 March when it was raised to allow a pair of workboats with a small barge, presumably from the Doosan Babcock works to pass through. whose image appears on the Clydesdale Bank`s new polymer £5 banknote issued to celebrate the 125th anniversary of the opening of the Forth Bridge, was born at Houston in Renfrewshire and despite leaving school at 9 years of age to work, initially in a cotton mill and later as a blacksmith, he attended night school where he learned the principles of civil engineering. 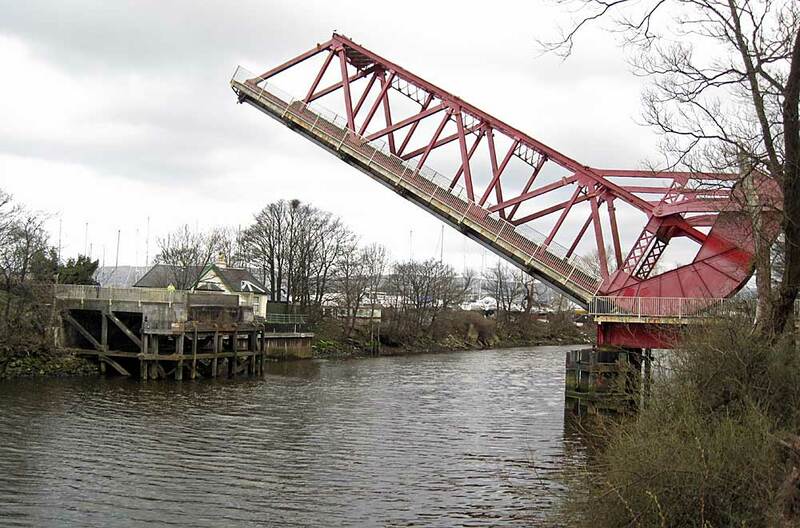 In 1863 he joined a company in Glasgow that specialised in bridge building and by 1872 he had established his own business in the east end of the city. 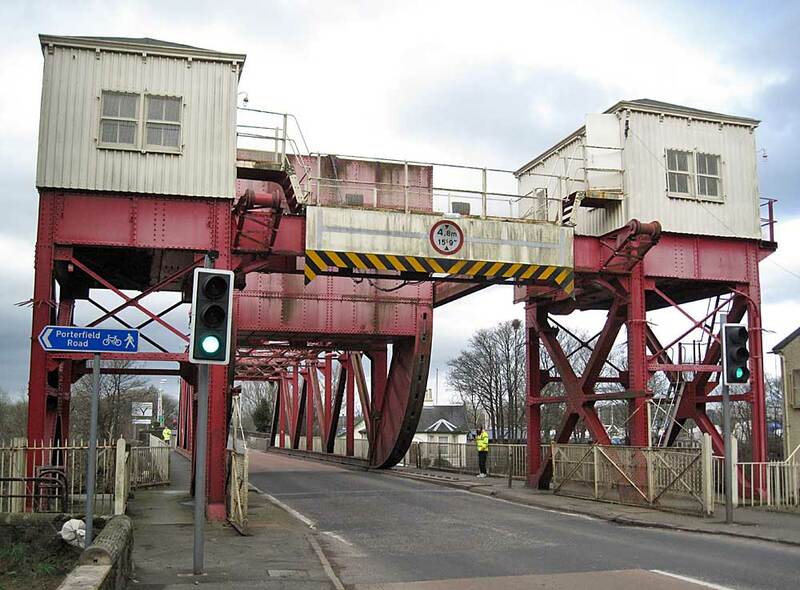 He expanded it to incorporate the Parkhead Crane Works and in the years that followed, even after Arrol had died, his company built some of the best known bridges in the British Isles. 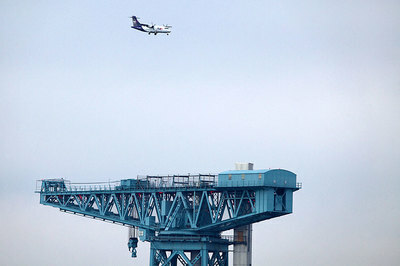 Structures included both Forth Bridges, the Tay Railway Bridge of 1887, Tower Bridge in London, the Middlesborough Transporter Bridge (as featured in Series 3 of Auf Wiedersehen Pet), and bridges over the Humber and River Severn. 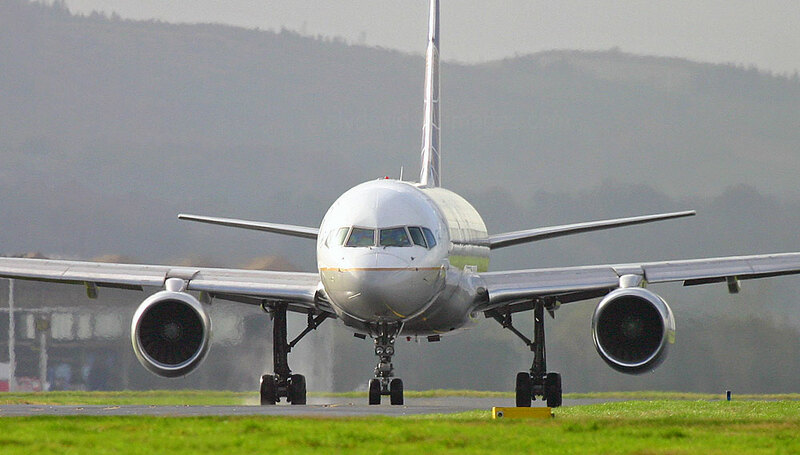 Earlier this month, at Paisley Sheriff Court, two American pilots with United Airlines were convicted and jailed for 10 months each after they admitted boarding an airliner at Glasgow on 27 August last year while over the legal alcohol limit. 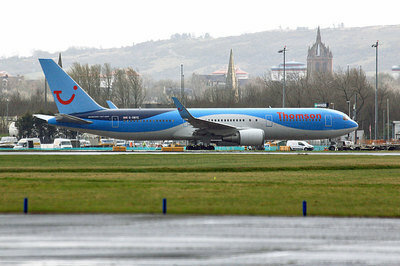 The 35 year-old First Officer, who is also a US Air Force reservist, and Co-Pilot (45) were on the flight deck preparing the aircraft for the 09:00 departure to Newark, New Jersey, with their passengers on board when police responded to concerns raised by security staff who were alerted to the pilots` condition having detected a strong smell of alcohol when the men passed through screening. ​​​Subsequent tests revealed both had considerably more alcohol in their system than was legally permitted. 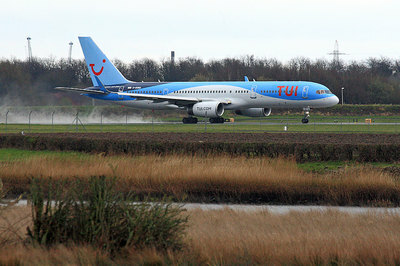 The Boeing 757 took off later that day with a replacement crew and 141 passengers. Boeing 747 G-VROS lining up for a Runway `05` departure on 10 March. 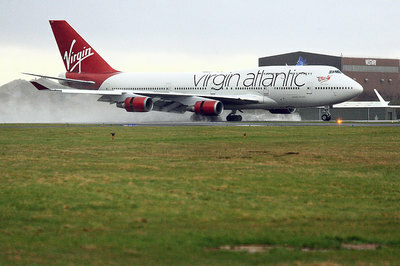 ​Virgin Atlantic`s `Hot Lips` (G-VLIP) sets off for the Orlando sunshine on Friday 17 March. G-EZRA, one of easyJet`s new Airbus A320-214s, made its first visit to Glasgow International on Wednesday 8 March. ​Boeing 737-8K2(WL) PH-HSE Transavia, A319-132 D-AGWU Germanwings (f/v), plus Backbone Aviation`s CRJ-200LR OY-RJC and Icelandair`s Aurora Borealis 757 TF-FIU both returned (27th); Airbus A319-112 D-ABGJ Eurowings (f/v), A321-231(WL) HA-LXN Wizz Air (f/v) (28th); A320-214(SL) D-AEWG Eurowings with `Visit Sweden/Göteborg titles and yet another appearance by TF-FIU Hekla Aurora (29th); Airbus A320-214(WL) D-AIZU Eurowings (f/v), easyJet A319-111 G-EZDN in Amsterdam livery and G-EZBG in Hamburg livery, plus Boeing 737-8AS(WL) EI-FZF Ryanair (f/v) and Ryanair 737 EI-EMI in National Express livery (30th); ​Boeing 747-41R G-VXLG Virgin Atlantic, Airbus A320-214(WL) D-AIZV Eurowings (f/v) and A319-111 G-EZDN easyJet Amsterdam livery again (31st). It was raining heavily when easyJet`s `Romeo Alpha Juliet` touched down on Thursday 16 March. 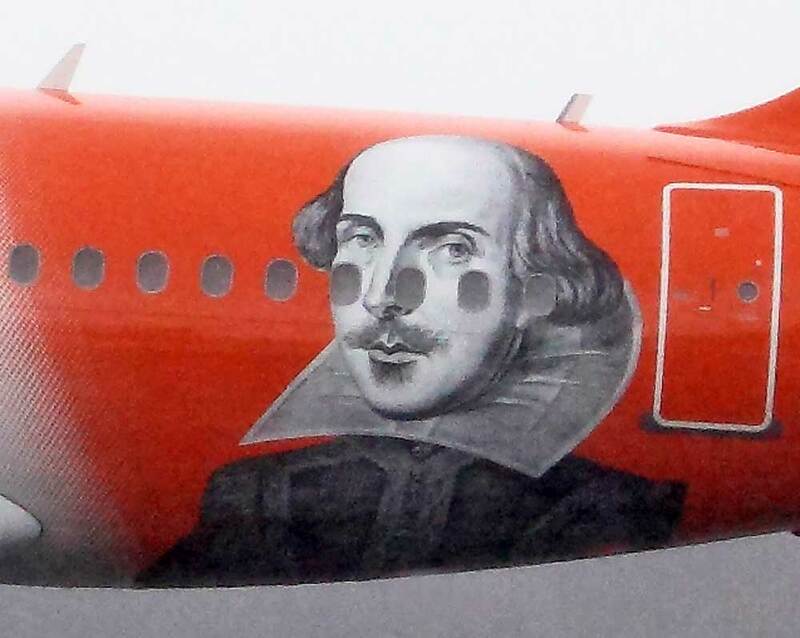 The large image of the writer of Macbeth and Hamlet was painted on the fuselage of Airbus A319-111 G-EZBI in 2014 as part of a campaign to recognise “William Shakespeare Day”. The aim was to get 100,000 people to sign a petition supporting the proposal, which would instigate a debate about the issue in Parliament. The day - which is the playwright's date of death - was not intended to be a bank holiday, but would celebrate the literary figure, who many see as a leading symbol of Britain’s cultural heritage. 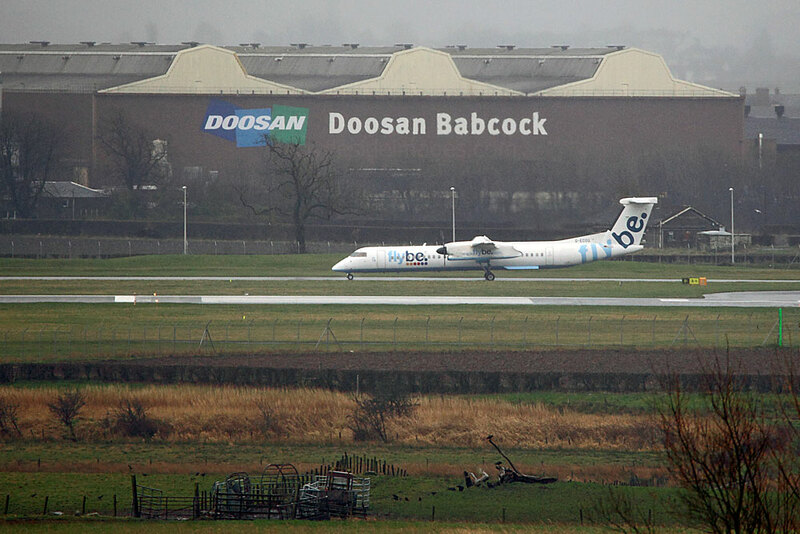 Who knows, when Loganair ends its franchise with Flybe later this this year, we might see Rabbie Burns adorning one of its Twin Otters! Boeing 777-31H(ER) A6-ENN about to land on the 15th. 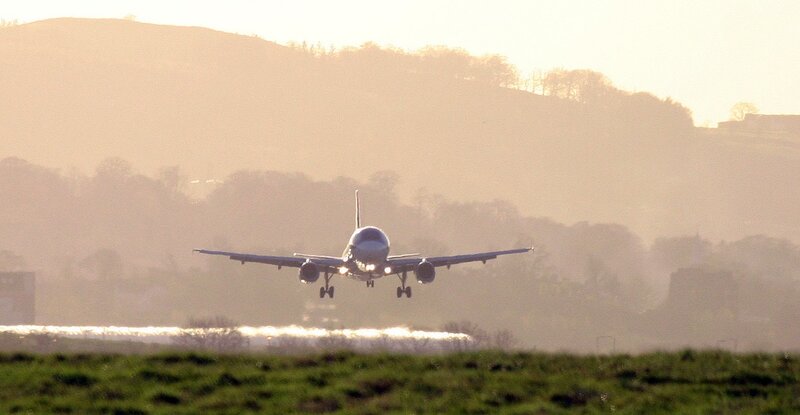 Airbus A330-243 C-GTSI lifting off on the 16th. 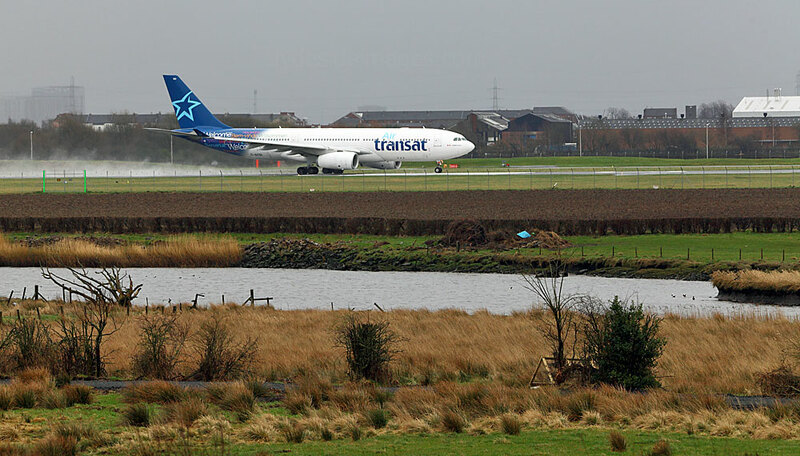 Between July and September this year, Air Transat`s Glasgow to Toronto route will be mostly served by these larger airliners rather than their Airbus A310s due to an anticipated increase in demand for seats. 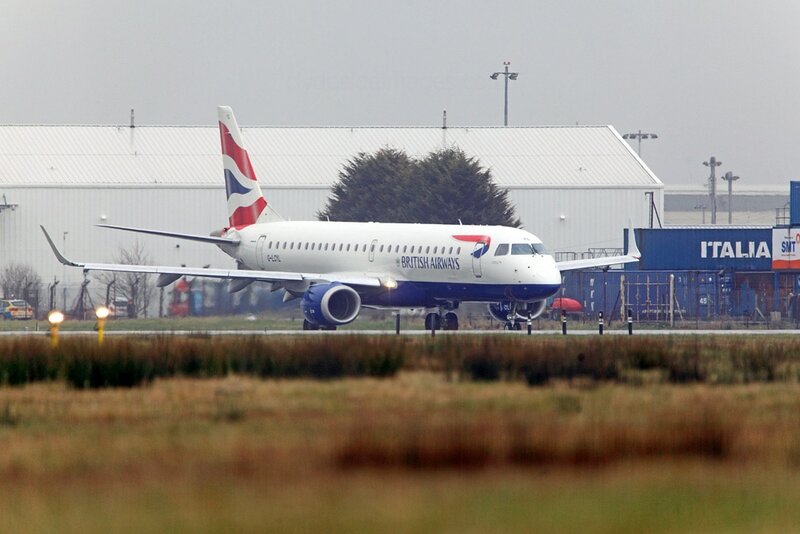 Czech-registered Travel Service Boeing 737-9GJ(ER)(WL) OK-TSM made its first visit to Glasgow on Thursday 16 March along with its 200 passengers, all refugees from the conflict in Syria. The aircraft, which arrived late morning, had flown from Beirut. Lebanon, and stayed on the ground for just an hour to unload and refuel. 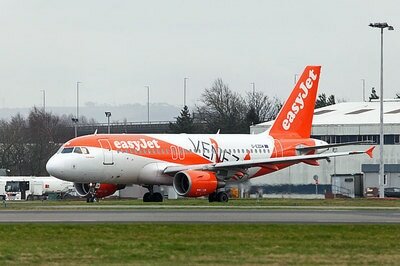 April 9 2017 was the 50th anniversary of the first flight of the Boeing 737. Although the overall shape of the airliner hasn`t changed significantly in half a century, today`s versions are drastically different technology-wise from the early variants. To date, over 9.400 of the type have been built with a further 4,300 on order. Around 7,000 are currently in service with airlines, government and military operators around the globe. 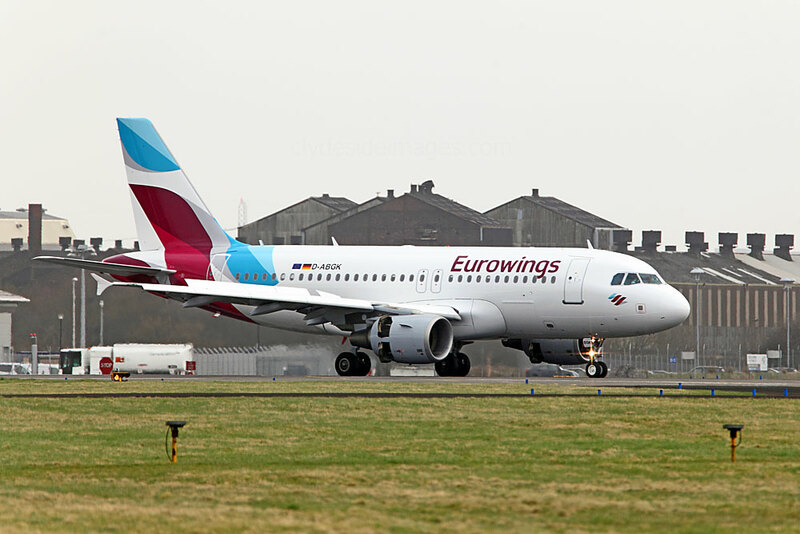 Eurowings has retired the last of its Bombardier CRJ900s which were for years regulars on the Dusseldorf - Glasgow `run`. The last four aircraft were withdrawn in February 2017 and will go back into service with Lufthansa Cityline. 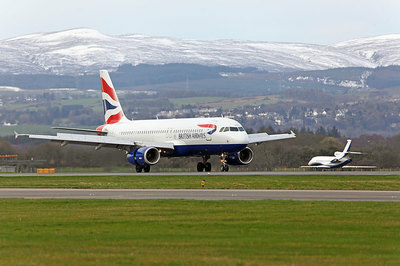 Airbus equipment, such as A319-112 D-ABGK, pictured above arriving on Monday 13 March this year, is now used on all Scottish flights. 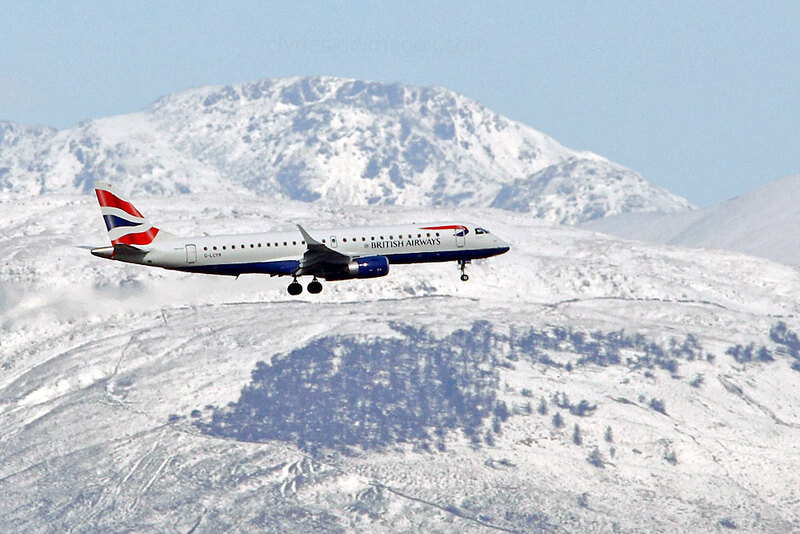 Earlier this month, it was announced that Eurowings will operate a Glasgow to Salzburg service once a week from 6 December 2017 on Wednesdays which should prove very popular with Scottish skiers. 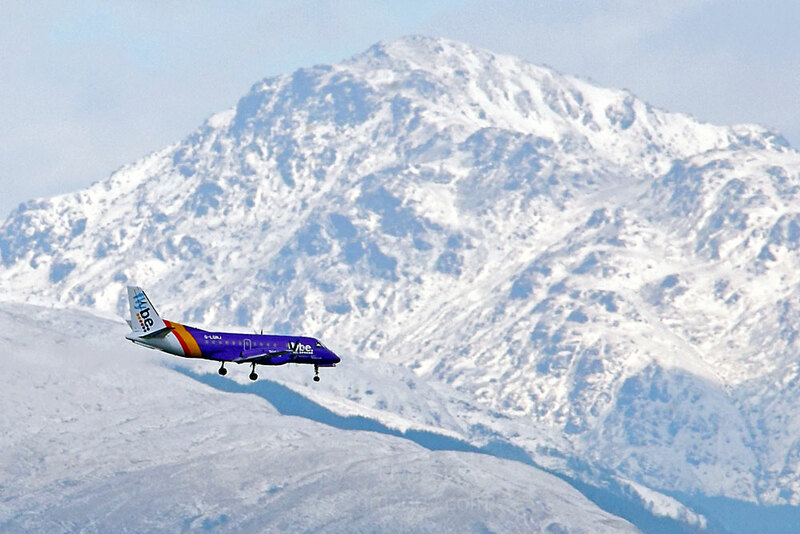 ​This is ​Airbus A320-214(WL) D-AEWQ (f/v) on finals on the 22nd with the Arrochar Alps rather than the Austrian Alps forming the backdrop. Ryanair will also introduce new routes from Glasgow as of October 2017: There will be a four times-weekly flight to Madrid, a twice weekly to Krakow and a daily flight to Frankfurt. 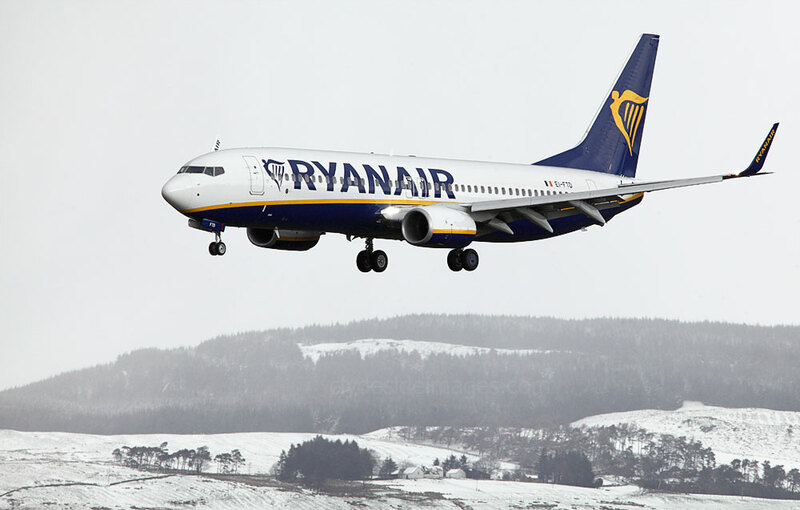 Ryanair, which is already the largest Boeing 737-800 customer in the world and the largest operator of Boeing airliners in Europe, took delivery of its 450th 737-800, a 737-8AS(WL) variant registered EI-FZF, this month. The fleet now stands at 380 aircraft, with two in storage and a further eighty-two 800 series on order. This is in addition to 100 of the new 737MAX-200 airliners due for delivery sometime in 2018. 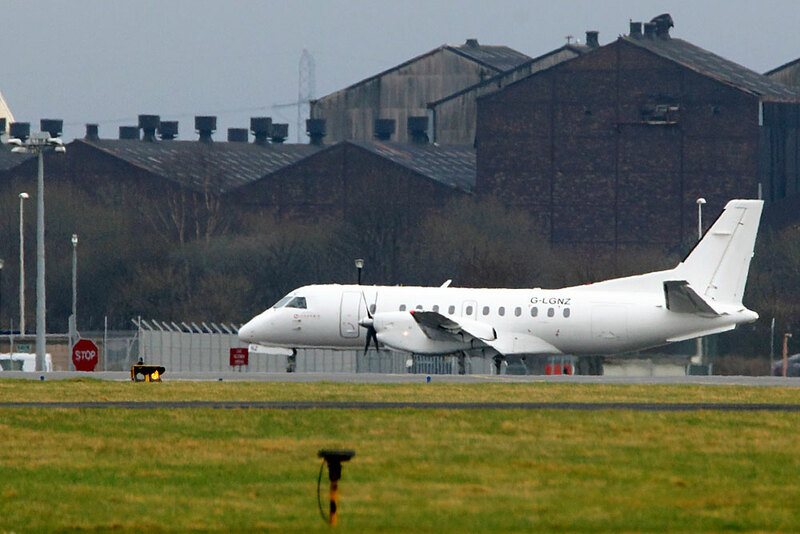 ​Another view of Sukhoi Superjet 100-95B EI-FWA of Irish airline CityJet which arrived on a Rugby charter on Friday 24 March. 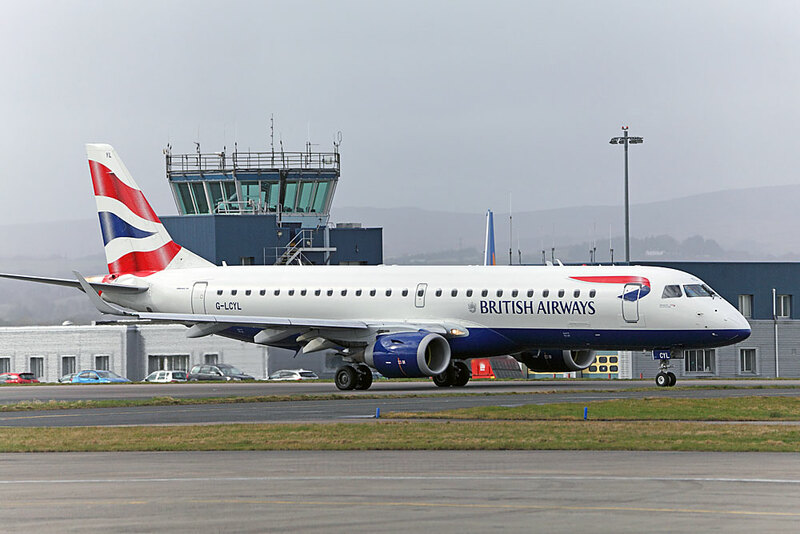 Brussels Airlines will lease three of these airliners from CityJet this summer. Two aircraft will be operated from the end of March with a third scheduled to be added later. Edinburgh will be one of the destinations served with the type. 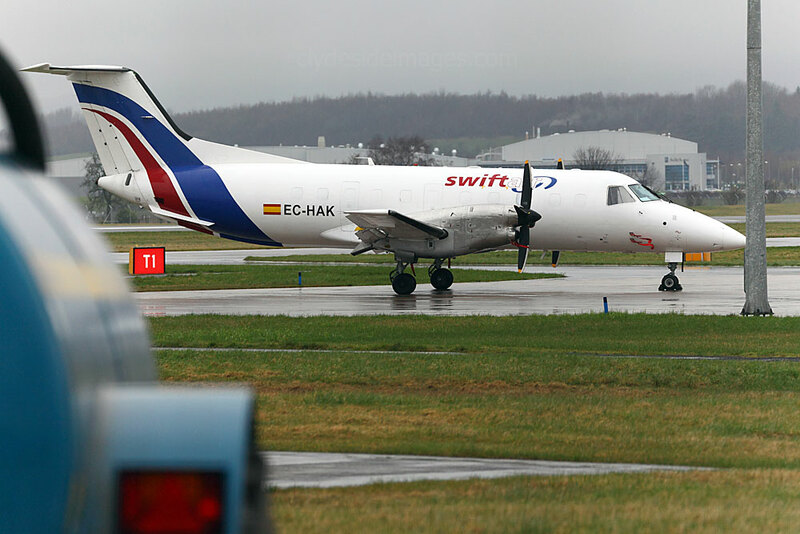 This shot of Warsaw-based Sprint Air`s Saab 340A SP-KPR was taken on the 2nd. 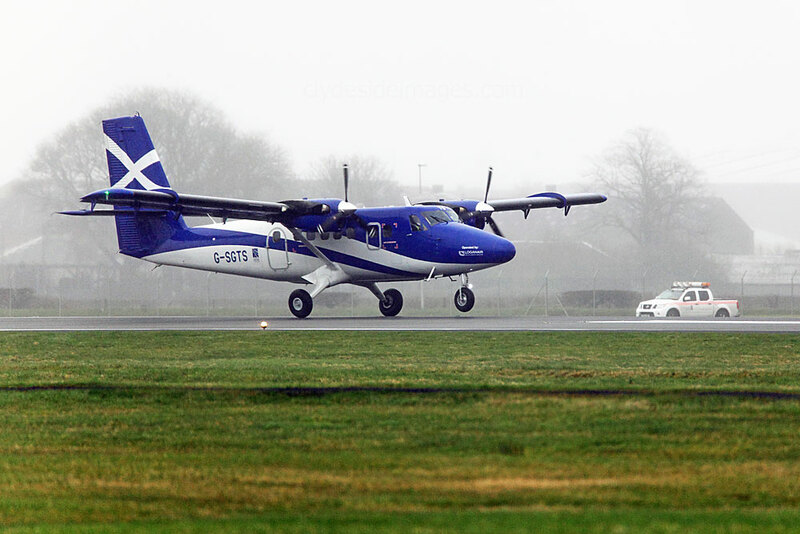 It was drafted in to cover `virtual airline` Citywing`s Turbolet flights after the Civil Aviation Authority (C.A.A.) 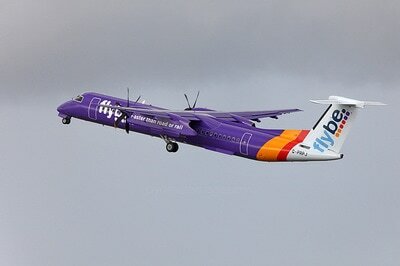 withdrew Van Air`s route licences on 24 February. 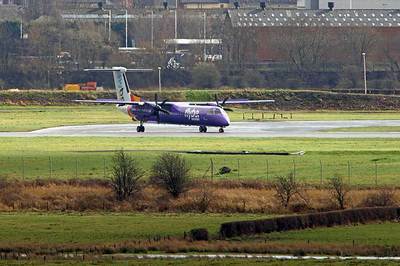 The ruling was made after an investigation into an incident which took place last month during a flight between Belfast and Ronaldsway Airport, Isle of Man, at the height of Storm Doris. Citywing directors said the company sustained considerable losses in the attempt to source suitable replacement aircraft to fullfil its contracts and reluctantly were forced to shut down. Unfortunately it now looks as though we`ve seen the last of Van Air’s squat LET410s which have been a regular feature at Glasgow International for years. If the visibility is good when aircraft are on approach for Runway `05` the scenery can often be spectacular, particularly after a heavy fall of snow. 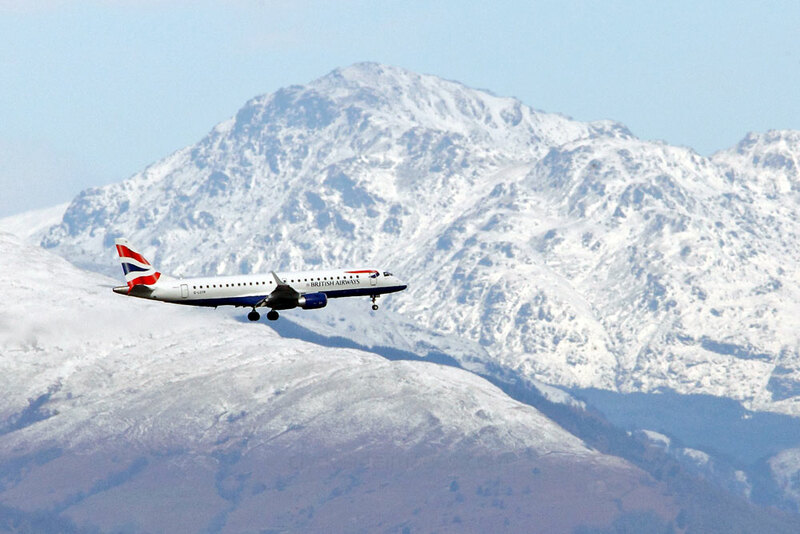 The line of peaks that forms the jagged skyline includes the Cowal Hills, Luss Hills, Arrochar Alps and Ben Lomond which is Scotland`s most southerly Munro. This is the name given to any Scottish summit which attains or exceeds 3,000ft. 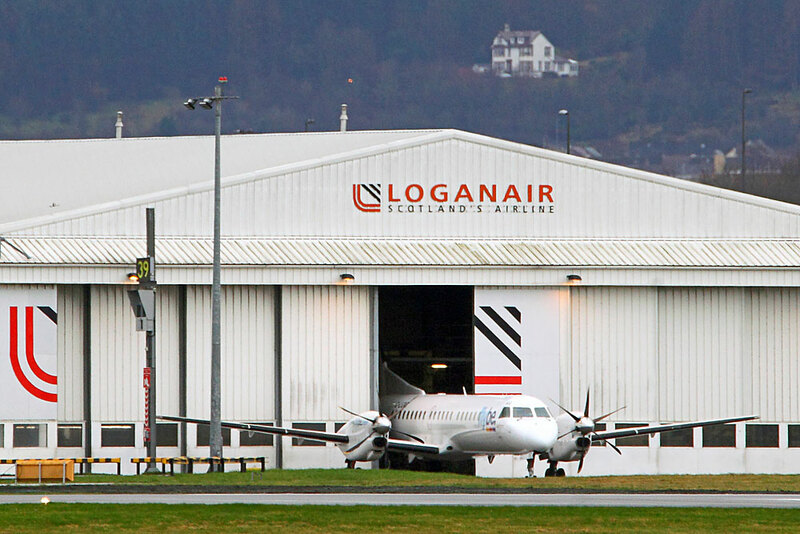 The latest addition to the Loganair fleet is ex-TUS Airways Saab 320B G-LGNZ (f/v) which was delivered from Örebro Airport, Sweden on 5 March. 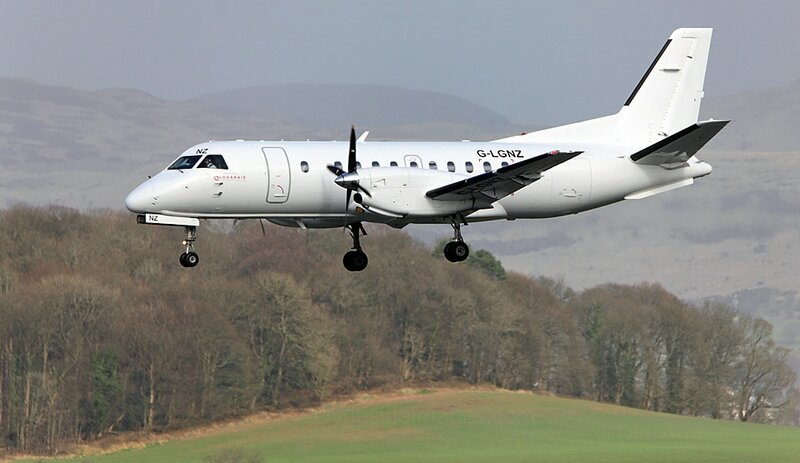 ​Above: The latest addition to the Loganair fleet is ex-TUS Airways Saab 320B G-LGNZ (f/v) which was delivered from Örebro Airport, Sweden on 5 March. 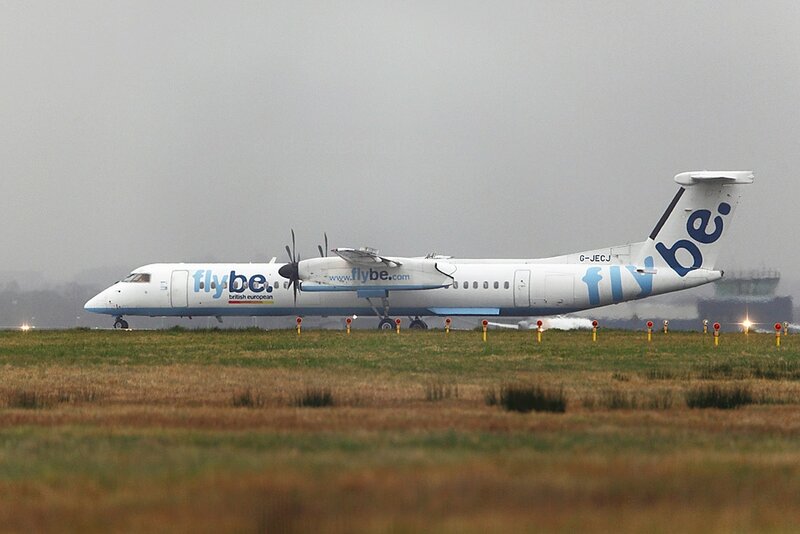 The only other turboprops of note to appear during March were DHC8-402Q G-PRPF Flybe (f/v) on the 23rd and, from the Slovenian register, ATR72-212 S5-ACK of Aero4m (f/v) on the 30th. 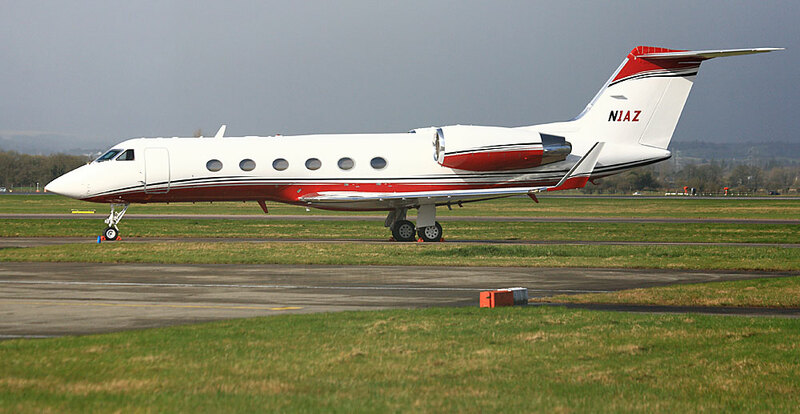 Standout corporate visitors this month were a pair of Gulfstreams belonging to the Bahrain Royal Flight: A9C-BRN (call-sign `Bahrain 5`) arrived just before 21:00 hrs on Thursday 9 March while Gulf 4 A9C-BRF (`Bahrain 7`) landed the following afternoon. Both jets, which were making their first appearance at Glasgow International, took off on the following Saturday morning. A9C-BRF took-off just before I reached the airport and I had to content myself with the grainy shot below - this local resident wasn`t impressed either! No biz-jets called in on Wednesday 1 March although two night-stoppers from last month, Dassault Falcon 7X N250LG and Gulfstream G150 D-CGEP departed. Taxiway `Y` on Saturday 11 March: Gulfstream V N225EE and Global Express XRS N726AF (f/v). Area Juliet on Tuesday 14 March: Citation Sovereign D-CAWX, Raytheon Hawker 750XP 9H-BSA and Challenger 300 G-KALS. 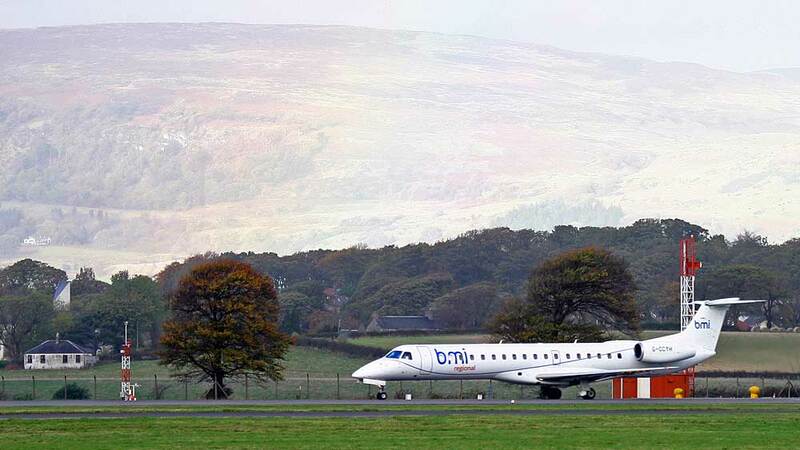 ​Isle of man-registered Bombardier BD700 Global Express M-ULTI (f/v) (21st); ​Cessna Citation Encore+ D-CAWR (f/v) (23rd); ​Bombardier Challenger 300 M-CLAB, Cessna CitationJet CJ3 D-CCBH (f/v) and Embraer EMB-135BJ Legacy 600 9H-WFC Air X (24th); Cessna Citation Excel G-IPAX (27th); Dassault Falcon 900EX N885B (28th); ​Citation Mustang OE-FWF (29th); ​Bombardier BD-700 Global Express (f/v) (30th); ​Embraer EMB-135BJ Legacy D-ALOA Air Hamburg (f/v), Raytheon Hawker 750 CS-DUB NetJets Europe, Raytheon Beechjet 400XTi G-FXCR (f/v), Cessna Citation II F-HAJV and Citation Excel G-IPAX (31st). Monday 13 March: Learjet 35A D-CCCA holds at `Alpha One` until a back-tracking Jet2 737 takes-off. A closer view of Challenger 300 G-KALS. Another view of Global Express XRS N726AF which was on its first visit to the airport. 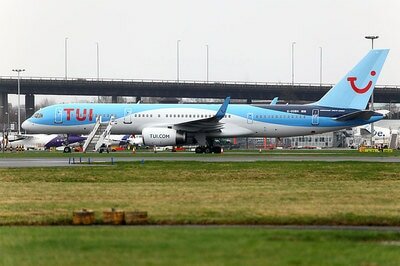 Taxiway `Y`, Thursday 9 March. 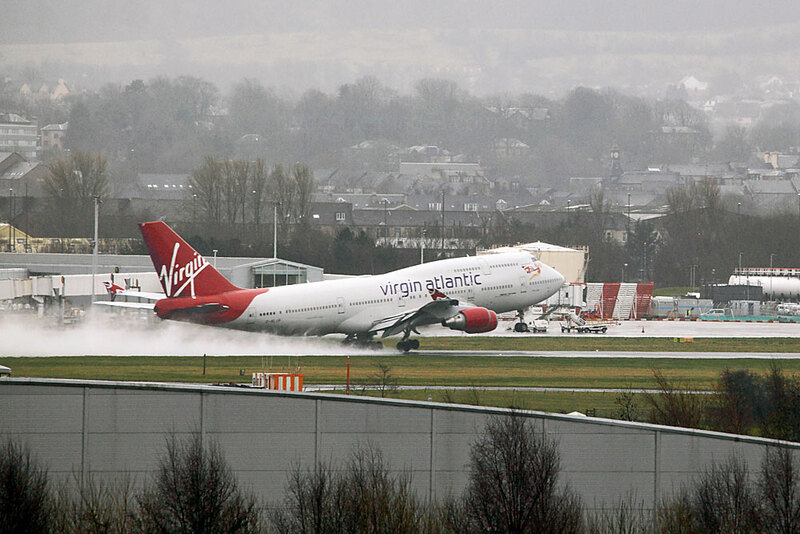 US-registered Learjet 60 N60LJ arrived at Glasgow International (f/t Keflavik) for the first time at 13:10 hrs on Thursday 9 March. Manx-registered Global Express M-ULTI (f/v) on Area R, Wednesday 22nd March. It was bound for Milan Malpensa Airport. 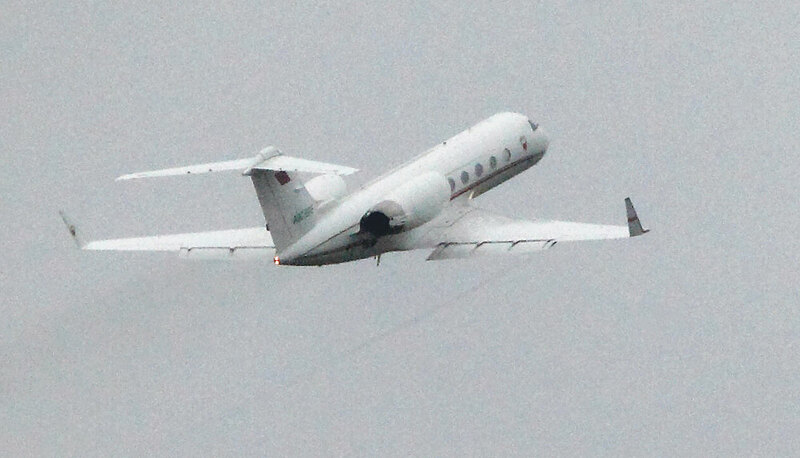 ​Gulfstream IV-SP N1AZ (f/v), an arrival from Dublin on the 19th, is seen here the following morning. It was destined for Baltimore, USA. Familiar visitor G-IPAX blocked views of Avanti M-GCAP and Falcon 900EX N885B on the 28th. Seen on taxiway `Y` on the 31st, Bombardier Global Express N519CP (f/v) had arrived from Edinburgh the previous evening - next stop Bangkok, Thailand. EC135-T2+ G-SCAA returned (16th); King Air 100 N327BA (f/v) and Piaggio P-180 M-ONTE which was flying from Glasgow to Nice (17th);​ King Air 200 G-FSEU and Cessna 208 Floatplane G-LAUD (19th); ​Cessna F.406 G-RVLW (f/v) and Cranfield University`s BAe-3100 Jetstream 31 G-NFLA which was temporarily based at Glasgow for the last part of the month (20th); King Air 200 G-FSEU (21st); ​King Air 200 G-CDFY and Piper PA-28 Cherokee Cruiser G-BRBW (22nd); King Air 200 G-CDMS (23rd); ​Pilatus PC-12 M-YBLS, Piper PA-46 Malibu Mirage N394SE (f/v) and Aerotechnik EV-97A Eurostar G-CENW (24th); ​Sikorsky S-92A G-MCGL HM Coastguard and King Air 200 G-FSEU (25th); ​Sikorsky S92A G-MCGL again (26th); ​King Air 90GTx G-MOSJ, King Air 200s G-WNCH and M-WATJ plus Piaggio P-180 Avanti M-GCAP (28th); King Air 90GTi N95VB (f/v) (29th); ​King Air 200 G-FPLD (30th); ​Piper PA-42-720 Cheyenne III N75LS (f/v) and King Air 200 M-LENR (31st). 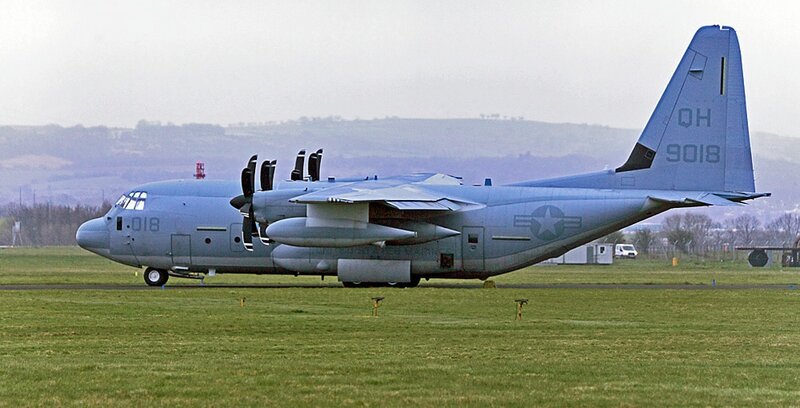 Lockheed EC-130H 73-1588 / DM (f/v), call-sign `Axis 41`landed at 22:10 hrs on Thursday 16 March and night-stopped, parking up on Taxiway `Y`. The ​US Air Force transport stayed until the morning of Saturday the 18th. It was routing to the USA from Ramstein, Germany, via St John`s, Newfoundland. 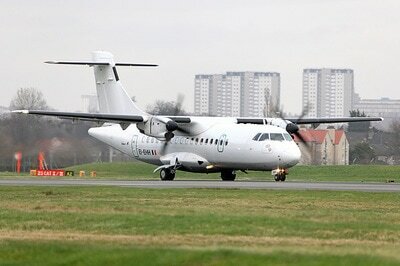 Royal Air Force BAe 146-100 CC.2 ZE701 (below) was Theresa May`s `taxi` when she visited Scotland on Monday 27 March. The Prime Minister addressed staff of the Department for International Development in East Kilbride, South Lanarkshire, and had a meeting with Scotland`s First Minister Nicola Sturgeon prior to submitting the UK`s formal notification to leave the European Union. 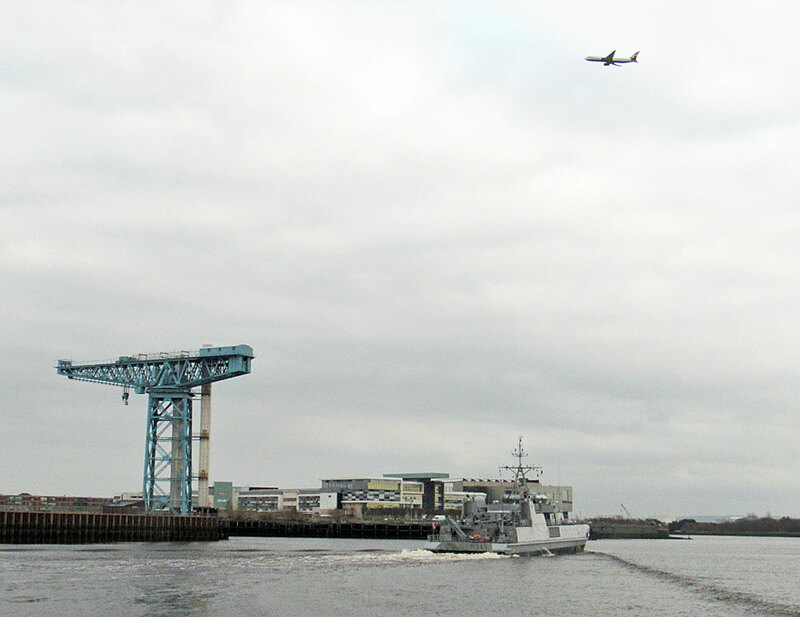 ​Other military aircraft calling in at Glasgow international this month were Agusta Westland 109SP GrandNew GZ100 (f/v) of 32 (The Royal) Squadron, RAF on the 7th and Beech C-12C Huron 76-0163 US Air Force (call-sign `Titus 2`) (f/v) on the 11th. 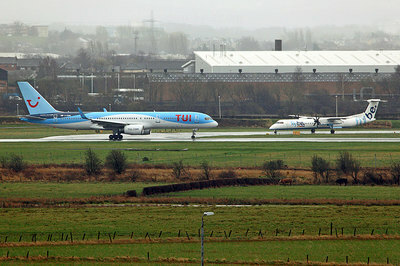 A pair of military transports were parked adjacent to one another on Taxiway `Y` for a time on the afternoon of the 31st. First to arrive was Lockheed Martin KC-130J tanker KC-130J 169018 (f/v) (below) of the US Marine Corps (USMC) which touched down at 16:00 hrs using the call-sign `Ranger 71`. C-160D Transall 50+82 had joined it within the hour but the German Air Force plane took off again at 18:10 whereas the Herc night-stopped which enabled me to take this shot the following morning. The first of 2017`s Joint Warrior military exercises began on 26 March and is scheduled to run until 6 April. Participating in the large scale event are naval units from Denmark, Belgium, Estonia, France, Germany, Netherlands, Norway, Spain, and the USA. 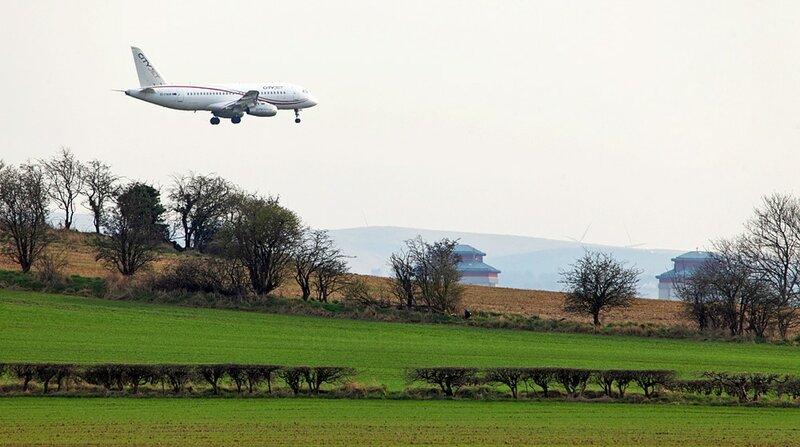 Military air crews are also flying out of RAF Lossiemouth in Moray and HMS Gannet at Prestwick in Ayrshire with live firing exercises taking place off Cape Wrath in Sutherland. ​Royal Navy Hawks and Dassault Falcons of Cobham Aviation Services are operating out of Prestwick for the duration. ​Click here for some additional shots taken at Prestwick during the exercise. The above shot shows one of the participating vessels, HNoMS Hinnøy (M343), an Oksoy-class mine hunter of the Royal Norwegian Navy, making its way to the KGV Dock on Thursday 23 March prior to the start of the exercise. 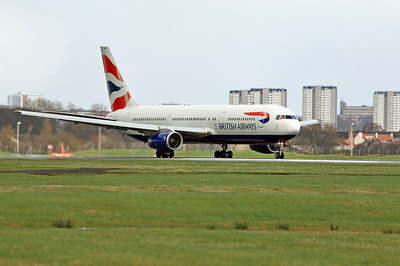 Boeing 767 G-BZHA on an afternoon Glasgow-Heathrow Shuttle has just just taken off from Runway `05`. This is 736 Naval Air Squadron (NAS) Hawk T.1A XX330 departing for the exercise area on Monday 27 March. 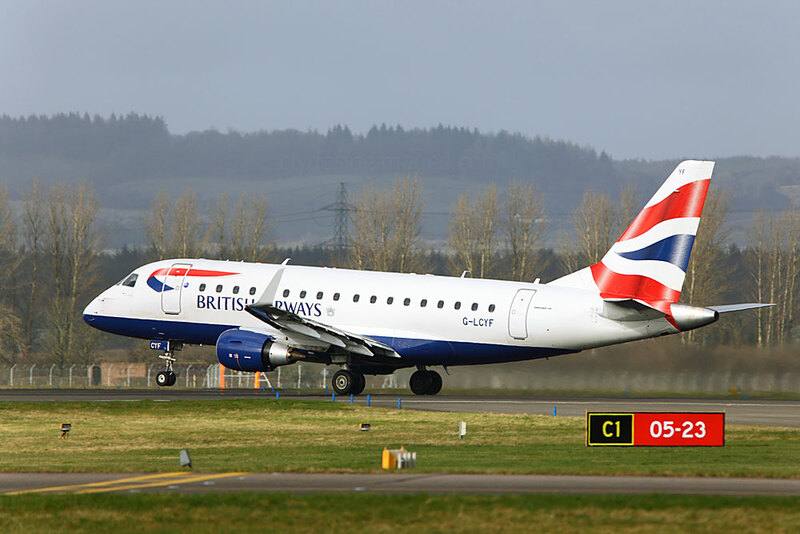 With the busy summer season not too far off, I thought this would be an ideal time to have a look back at just some of the airlines which were once a common sight at Glasgow but are no longer with us, starting with the British carriers. 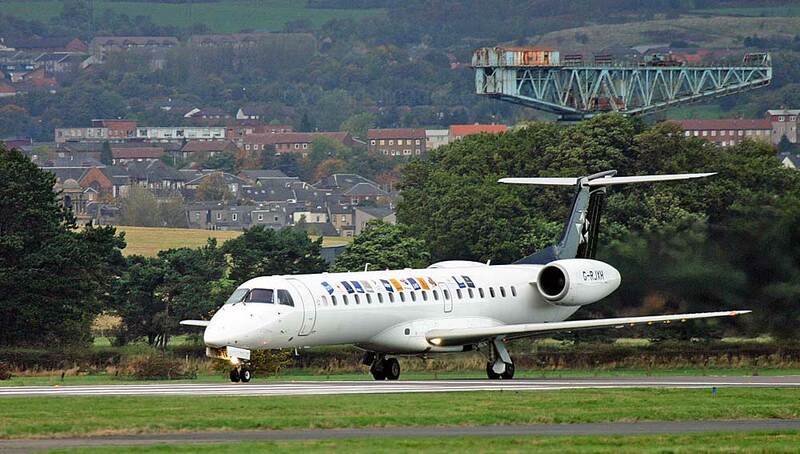 ​Based in Glasgow, Air Scotland was a low-cost outfit which operated scheduled services from Glasgow International and other UK airports to the Mediterranean and Athens. The airline was established in November 2002 by Iraqi-born businessman Dhia Al-Ani and began operations to Spanish holiday resorts in March 2003, using a pair of Boeing 757-200 aircraft operated by Electra Airlines. 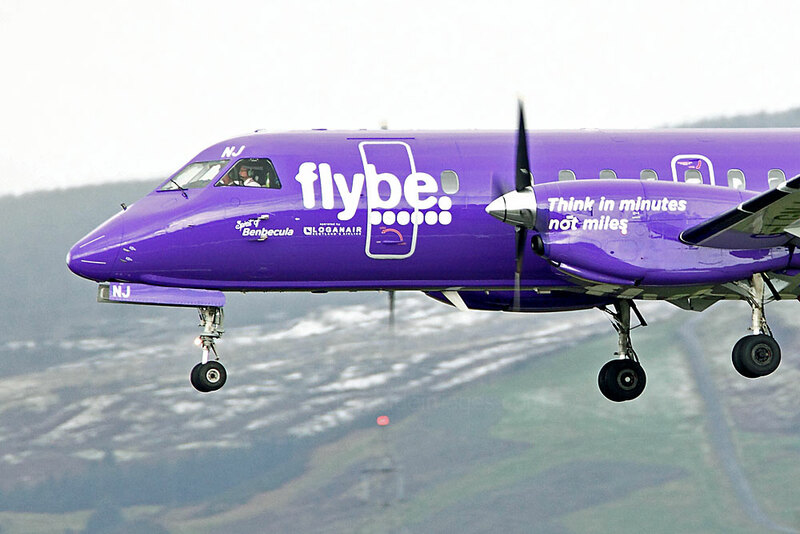 ​Air Scotland was a ticket provider for Electra until 25 April 2003, when all Electra Airlines planes were grounded by BAA plc over debts owed to the airport operator. 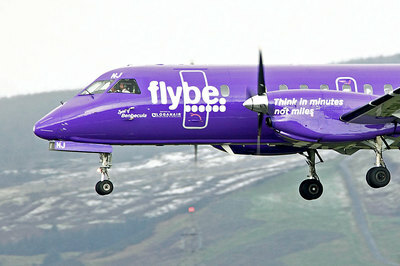 Air Scotland ceased the agreement with Electra and began operating with Air Holland, who agreed to take on the former Electra routes. 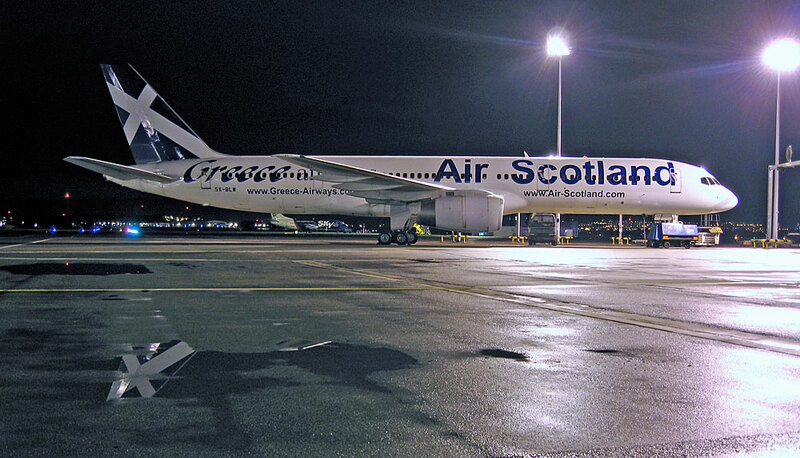 When Air Holland folded in March 2004, Air Scotland began operating under the air operator's certificate of Greece Airways, which was formed out of Electra and owned by Mr Al-Ani, albeit with just one 757 aircraft. At the start of October 2005 Al-Ani sold his stake in the airline to the `H Top` Hotels Group of Barcelona, Spain. 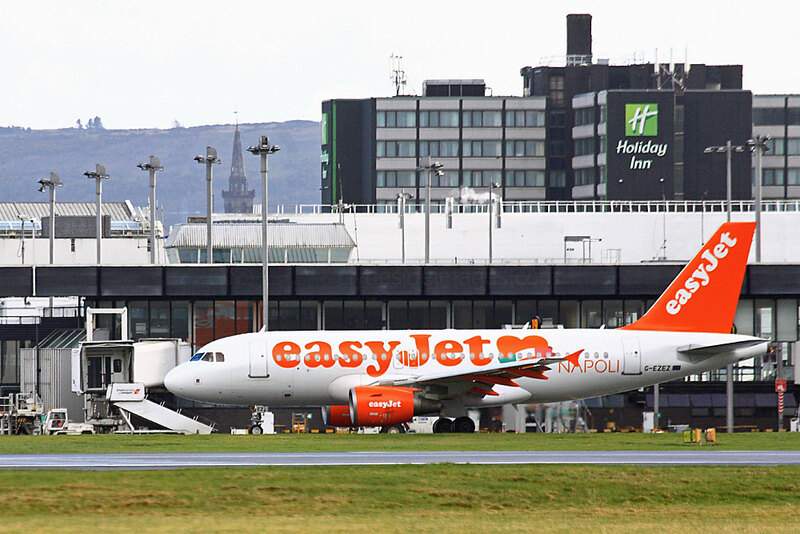 However, administrative difficulties in transferring ownership of the airline resulted in the operator's solitary aircraft being grounded at Palma over unpaid fuel bills and this immediately attracted widespread media attention. 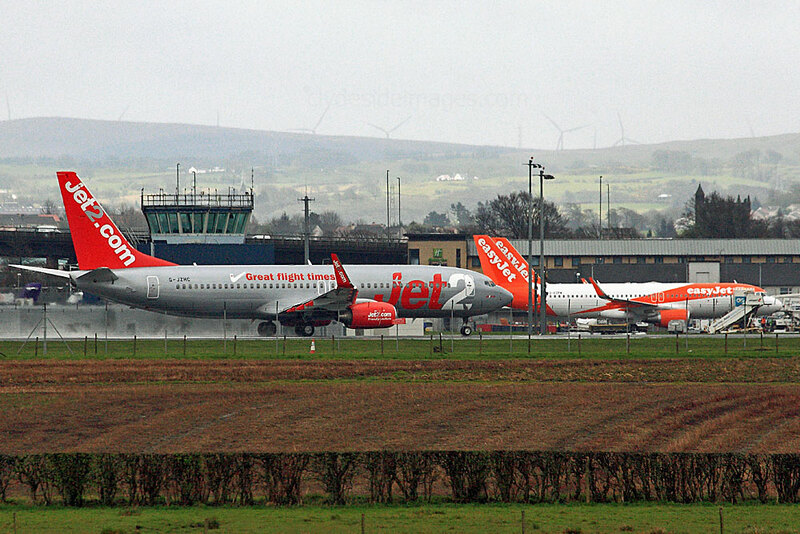 Irate passengers were left stranded for up to 17 hours and in one instance the police were called to ensure the situation didn`t get out of hand. The knock-on effect to the airline's network as a result of this delay was considerable. 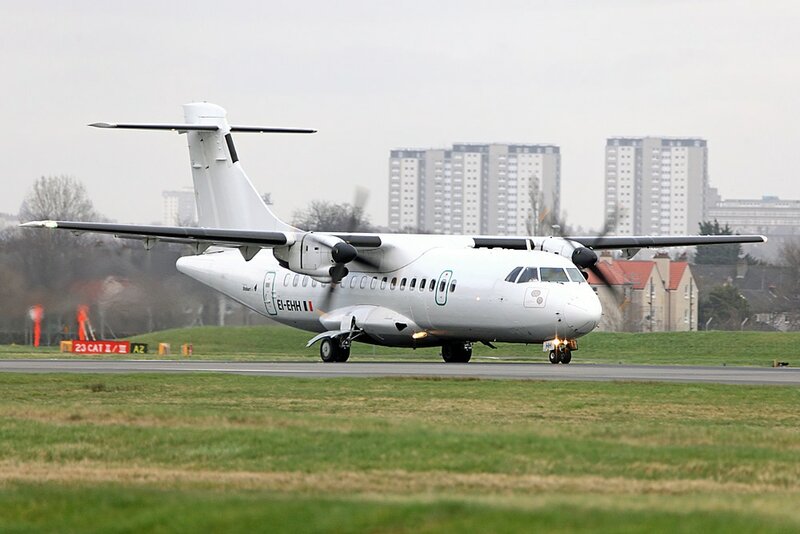 An aircraft was chartered from Fischer Air Polska to help clear the backlog, but it returned to Poland empty after the pilot refused service to Air Scotland as he erroneously believed that they had not paid their dues. Air Scotland had in fact transferred the required amount to Fischer Air Polska's account that morning. 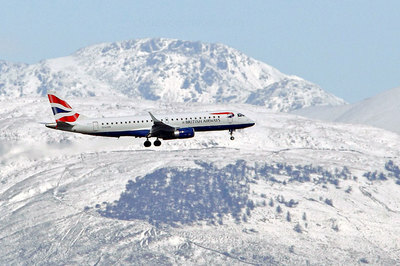 The Greek Civil Aviation Authority suspended Air Scotland`s Operating Licence and AOC in December 2006, consigning the short-lived airline to the history books. 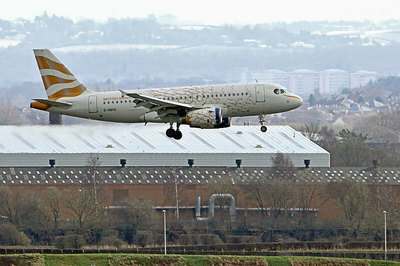 ​British Midland Airways Limited (trading at various times throughout its history as British Midland, BMI British Midland, BMI or British Midland International) used to be a major presence at Glasgow with connections via its operational base at Heathrow to destinations in Europe, the Middle East, Africa, North America and Central Asia. 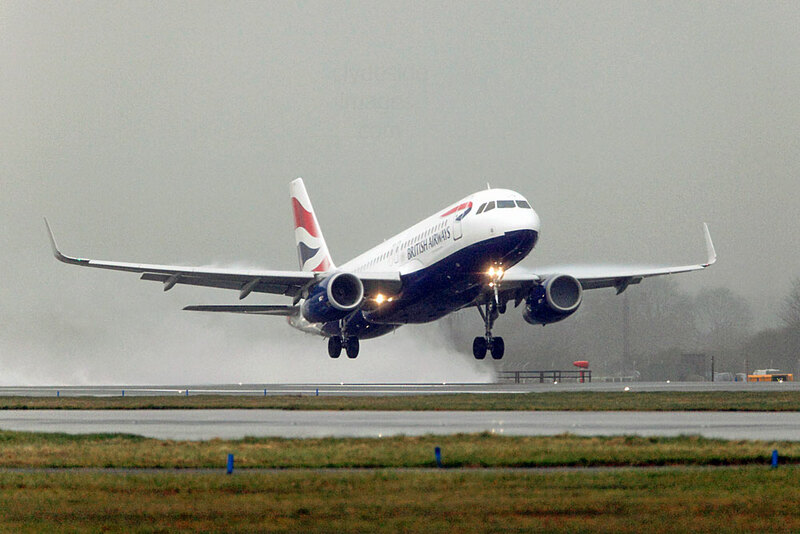 At its peak BMI accounted for approximately 13% of all takeoff and landing slots at London`s main airport and operated over 2,000 flights per week. ​By 2012, steadily mounting losses exceeded £100 million per year and this prompted reorganisation and a change in strategy. 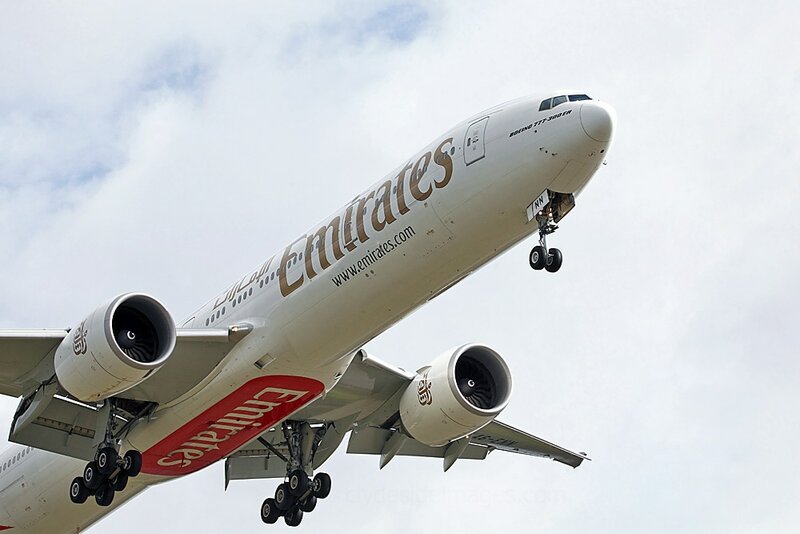 Business class on domestic flights was scrapped and a number of new, longer range, potentially lucrative international scheduled services from Heathrow were launched. 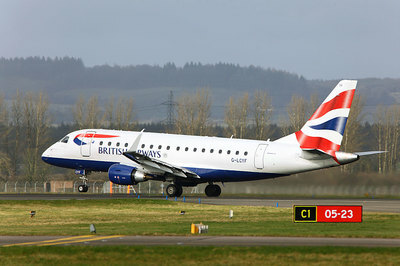 Frequency reductions and route cutbacks on the airline's loss-making short-haul routes were implemented, including the axing of its Heathrow–Glasgow route. 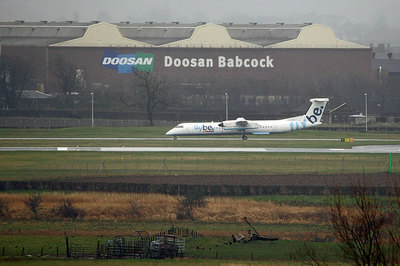 This service, which had been in operation for 30 years, ended on 27 March 2011. 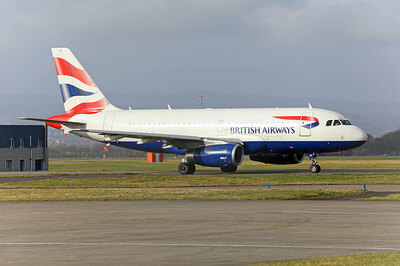 Airbus A321-231 G-MEDF ended BMI's last-ever commercial flight using a "BD"-prefixed flight number when in touched down at Heathrow on 27 October 2012. 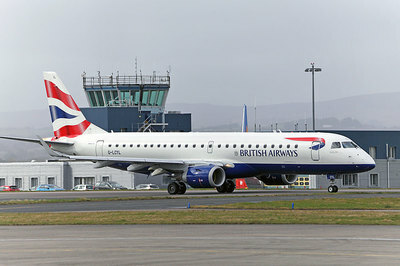 BMI was acquired from Lufthansa by International Airlines Group (IAG) on 20 April 2012, and was integrated into British Airways (BA) by 27 October 2012. 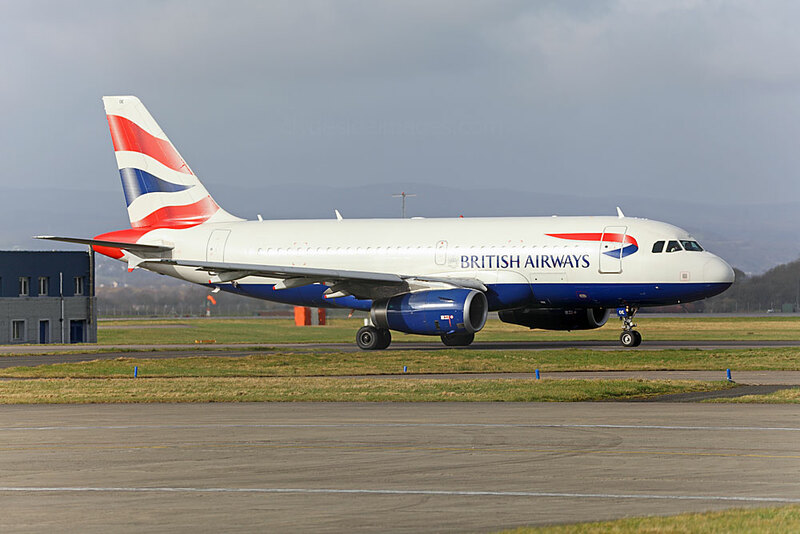 BMI's subsidiaries Bmibaby, which was a low cost operation, and BMI Regional were also purchased, although IAG did not wish to retain either. 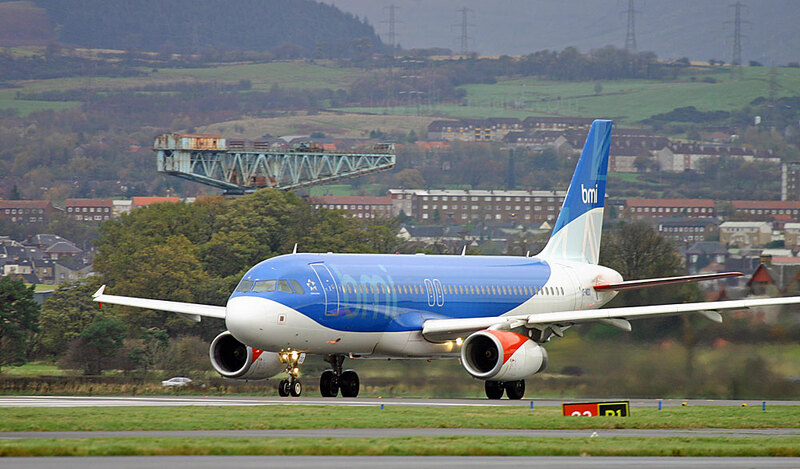 BMI Regional was sold to Sector Aviation Holdings in May 2012 and continues to operate, whereas Bmi baby closed down in September 2012. 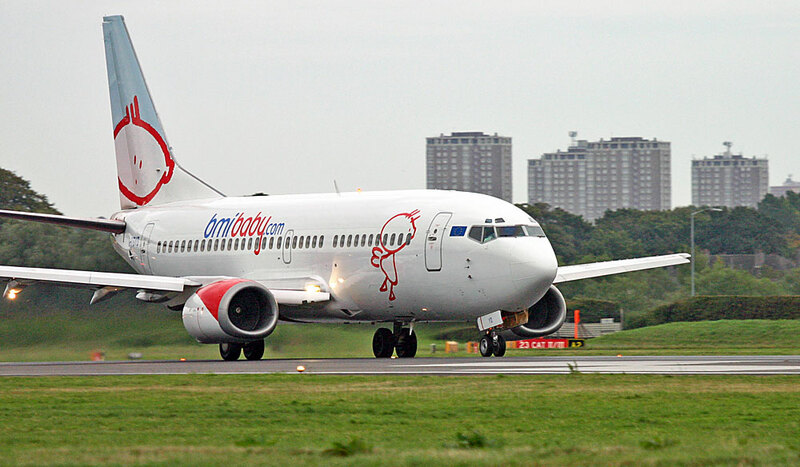 As of September 2012, the Bmibaby fleet consisted of 12 Boeing 737-300s and two 737-500s. 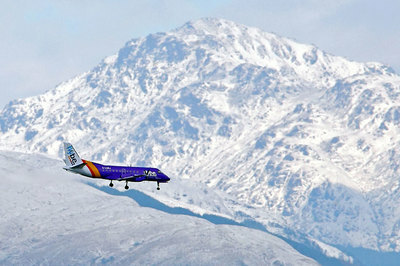 A bmi baby Boeing 737 in special `Visit Wales` livery sets off from Runway 23. 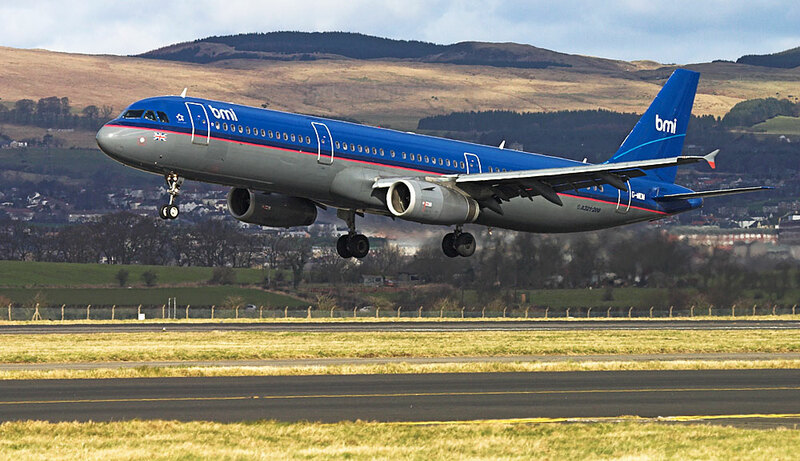 Although Bmi Regional is still operating, I`ve included a few archive shots, several of which show its airliners in non-standard colour schemes. ​EuroManx (no connection with Manx Airlines which operated for many years prior to its purchase by British Airways) was established on 7 August 2002 with its base at Ronaldsway Airport on the Isle of Man. The airline operated scheduled passenger services as well as business charters. EuroManx initially flew Beechcraft 1900 and ATR 42 aircraft which were leased from Rossair Europe and subsequently Fokker 50s leased from Dutch charter outfit Denim Air. 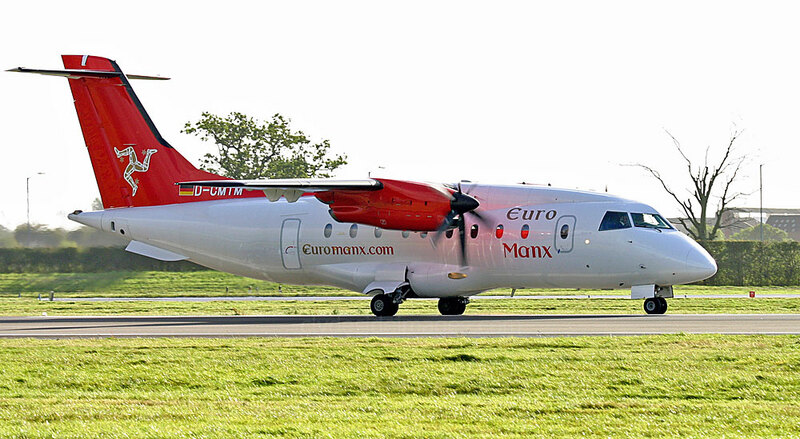 EuroManx introduced its own aircraft leased from various operators during the summer of 2005 with two Avro RJ70, two Dornier 328s including D-CMTM seen here, and a couple of Dash 8s. 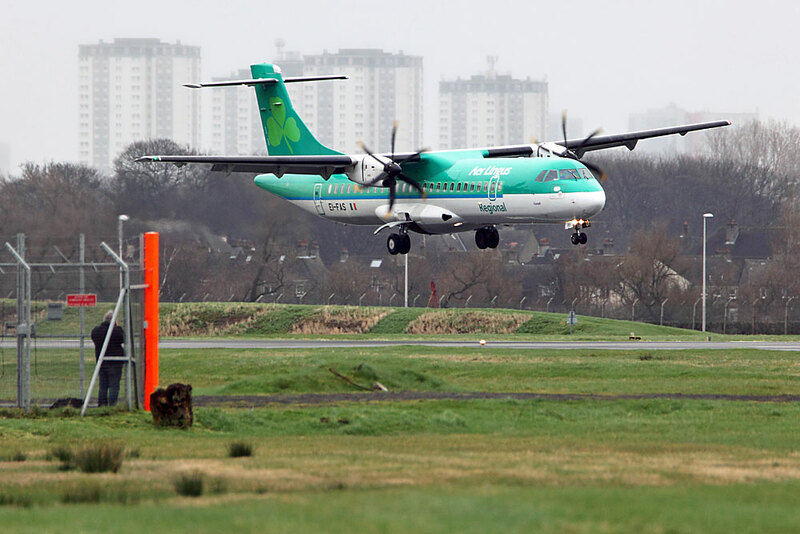 EuroManx successfully bought the passenger routes of Emerald Airways, another low cost carrier which had been operating services from Liverpool. 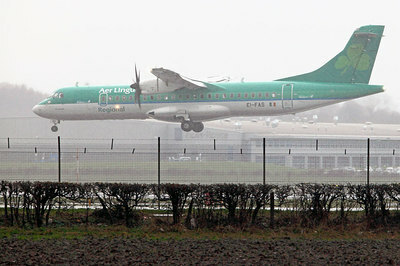 These flights were operated by an ATR leased from Aer Arann. 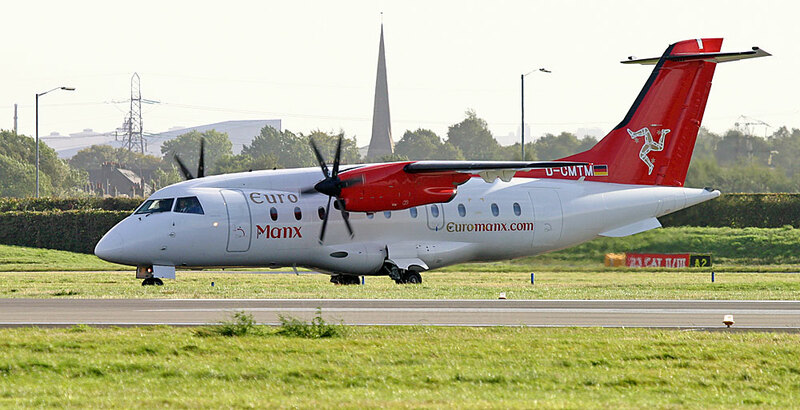 In October 2005, EuroManx restructured its operation, terminating all its scheduled international services except Dublin, and eliminating domestic services to Bristol, Southampton, Glasgow and London Stansted. 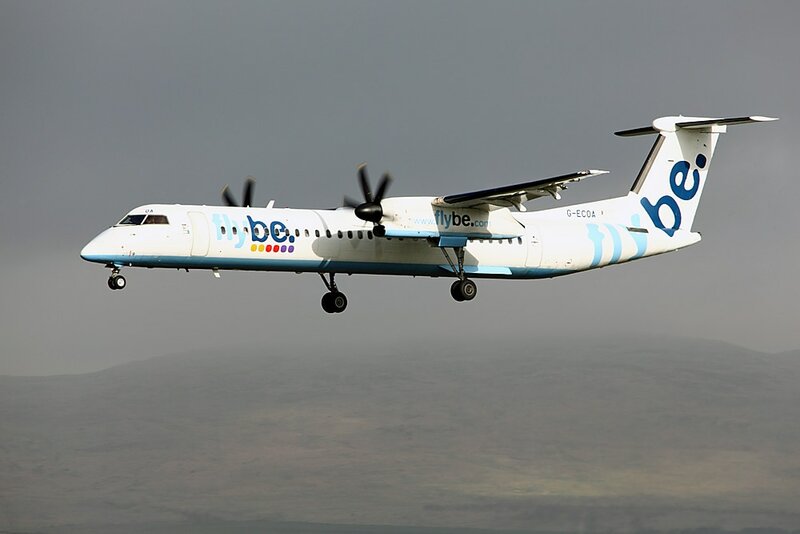 In May 2006, virtual commuter airline Manx2 began selling flights and services from several UK airports which were operated for Manx2 by a number of airlines including, Van Air Europe, FLM Aviation and Links Air. 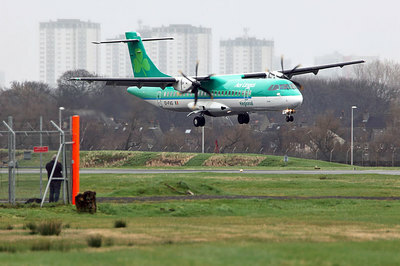 Competition forced EuroManx to restructure once again and it withdrew from the Dublin route. Operations continued with just two Dash 8 aircraft until 9 May 2008 when the airline announced that rising fuel prices and reduced passenger numbers had forced closure. 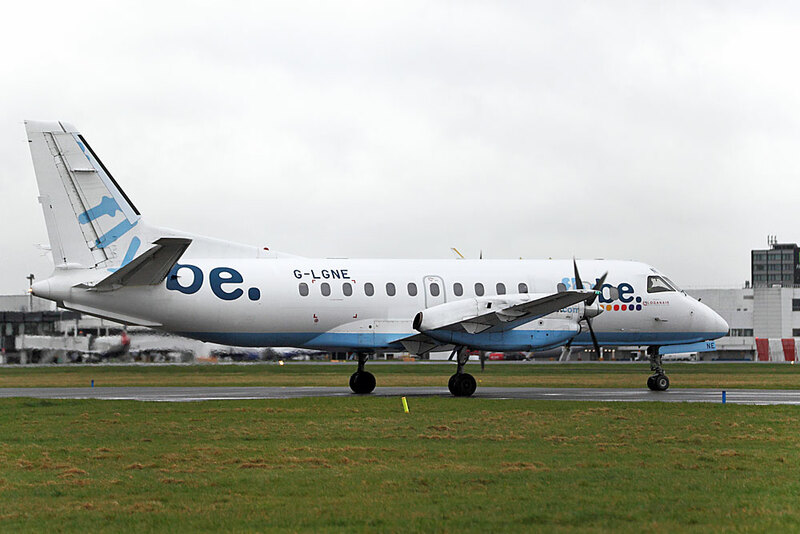 ​Part of the XL Leisure Group, Excel Airways UK was a low-cost charter and scheduled airline which offered short-haul and long-haul charter services predominantly to leisure destinations from its three bases at London Gatwick, Manchester and Glasgow. ​The airline was established in 1994 as Sabre Airways and started operations on 17 December 1994. 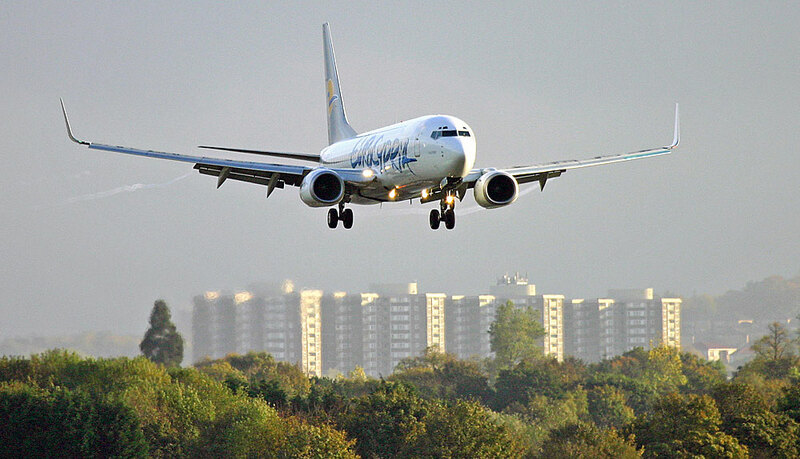 The name Excel was adopted in November 2000 following the airline`s acquisition by Libra Holidays Group. 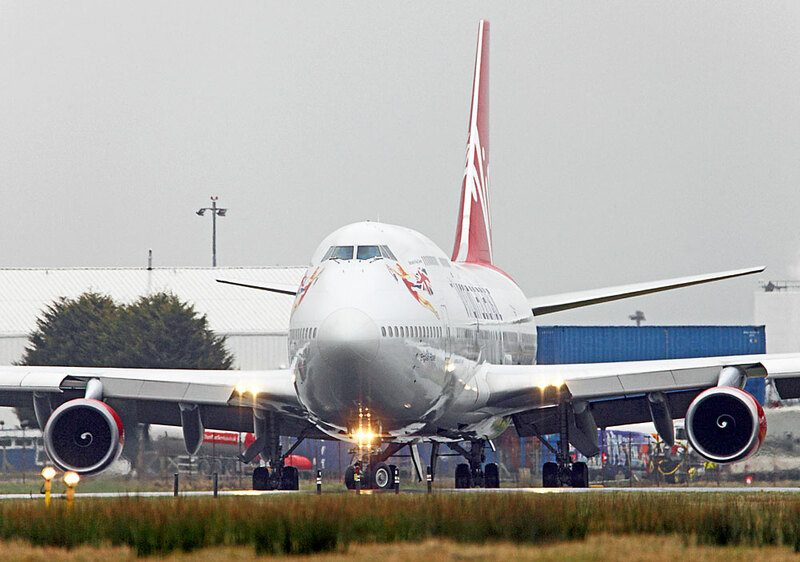 ​Following the merger of sister company Air Atlanta Europe in May 2006, Excel acquired three Boeing 747-300s which were operated for Travel City Direct between the UK and Orlando, however they left the fleet in November 2007 following expiration of their leases. ​Excel Airways leased two Next-Generation Boeing 737-900(ER) (Extended Range) airliners which were the first examples of this latest variant operate in the UK when they were delivered in May 2008. 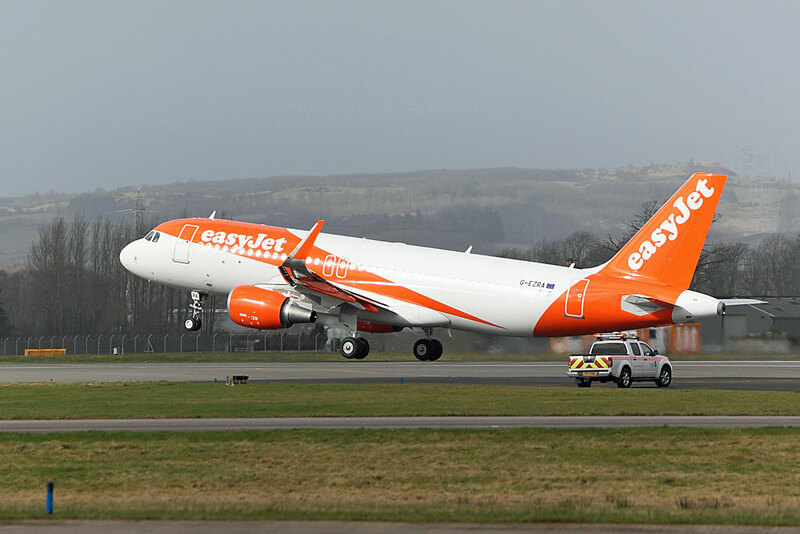 By that time the Excel Airways UK fleet included fifteen Boeing 737-800s, five 767s and four 747s, plus an Airbus A330-200 leased from XL France. On 11 September 2008, the parent company XL Leisure Group filed for administration citing volatile fuel prices and the general economic downturn, although for some time the group's website continued taking bookings. 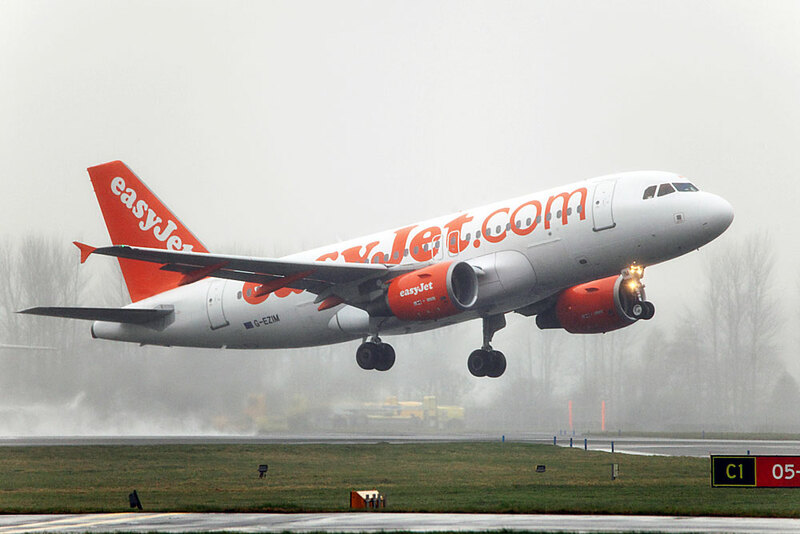 The airline`s collapse left around 90,000 passengers stranded at 50 destinations across Europe, the USA, the Caribbean and Africa. Around two-thirds were on package holidays, so were covered by the ATOL bond, but those who had booked direct, and were therefore not ATOL-protected, had to arrange their own flights home. 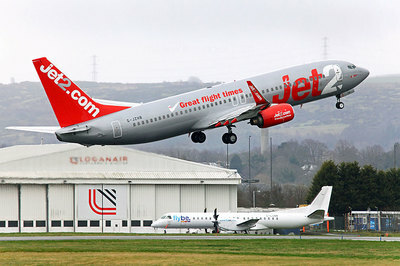 Two other airlines within the group had used the XL Airways branding, namely XL Airways France and XL Airways Germany but were not affected by the insolvency of the XL Leisure Group. 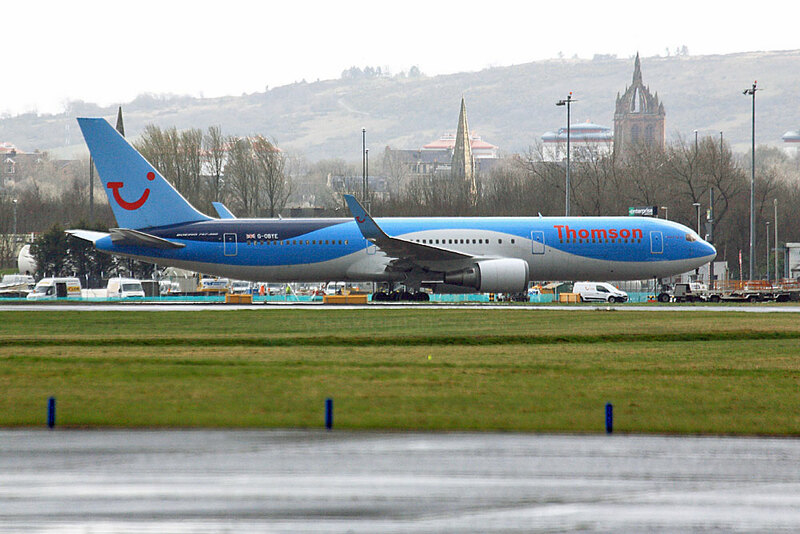 First Choice Airways was a British charter airline of European tour operator TUI Travel PLC, until its merger with Thomsonfly to form Thomson Airways in 2008. 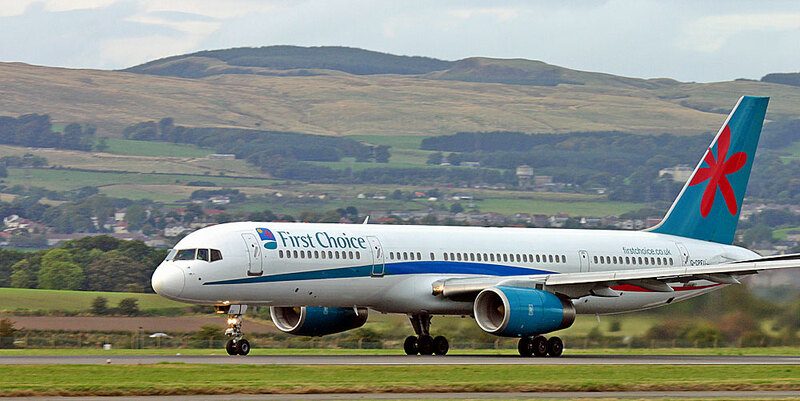 First Choice, which started operations in April 1987, flew to more than 60 destinations worldwide from 14 UK and Irish airports. 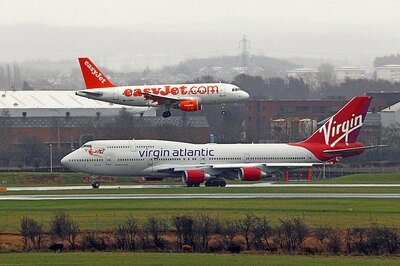 Its main bases were Birmingham Airport, Manchester Airport and London Gatwick, the latter airport being its main hub. The long haul flights and holidays were sold only by internal companies such as First Choice Holidays, Eclipse Direct, Sunsail, Sovereign, Hayes and Jarvis and Unijet. 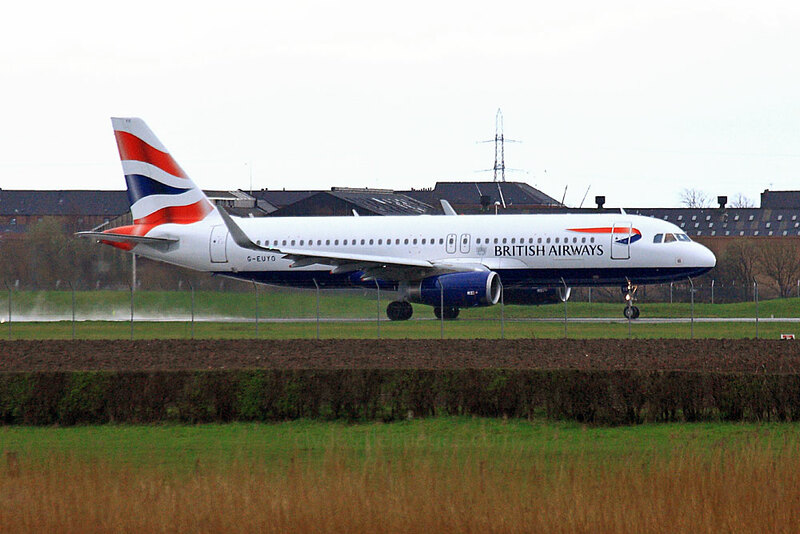 The First Choice fleet comprised Airbus A320-200, A321-200, Boeing 757-200 and Boeing 767-300ER airliners. ​Boeing 757-236 G-CPEU is shown here, taking off from Glasgow on 20 September 2005. 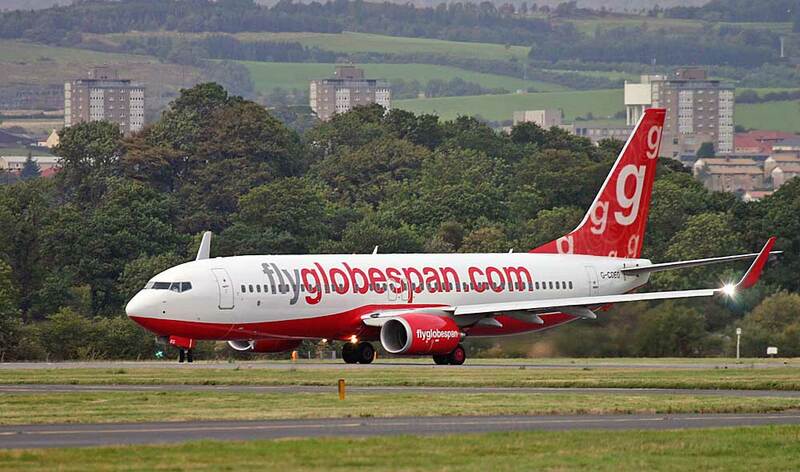 Established in November 2002 as an offshoot of the Globespan Group, Flyglobespan was a low-cost carrier based in Edinburgh. The well-established tour company Globespan, already offered flights, cruises, hotel accommodation and car rental etc for holidaymakers visiting destinations in the USA, Canada, and Spain. Scheduled flights, mainly to Canada, were in Air Transat aircraft with Globespan acting as the booking agent and the success of this arrangement led to the creation of its own no-frills brand, 'Flyglobespan'. 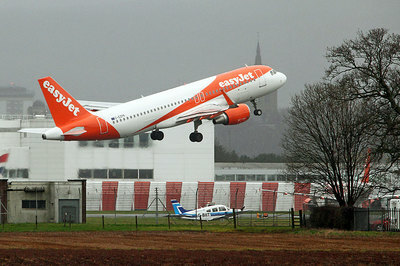 Services to European holiday destinations began in 2003 with aircraft and crews initially provided by Channel Express, though under the Flyglobespan brand with red and white livery. Flight frequencies were increased and the base was quickly changed from Prestwick to Glasgow International, the latter airport being much closer to the main population centres of Central Scotland. 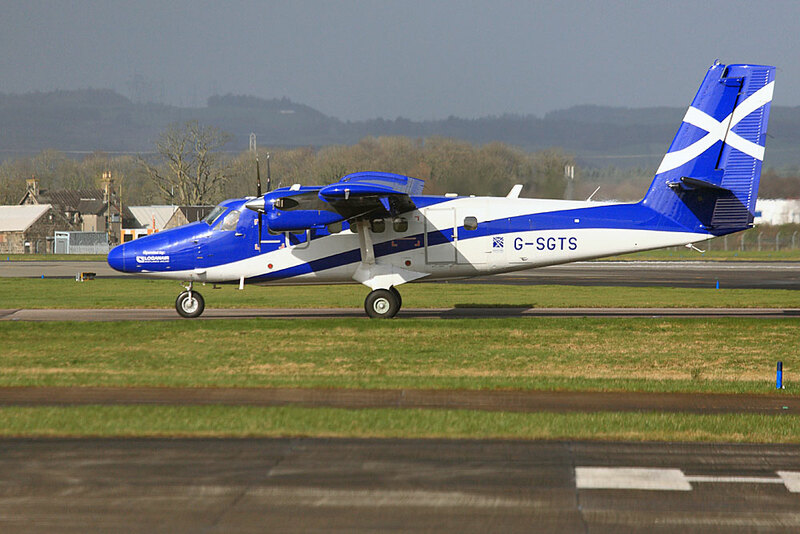 In 2004 the Globespan Group bought the defunct airline operator Cougar Leasing along with its Civil Aviation Authority (CAA) Aircraft Operating Certificate. 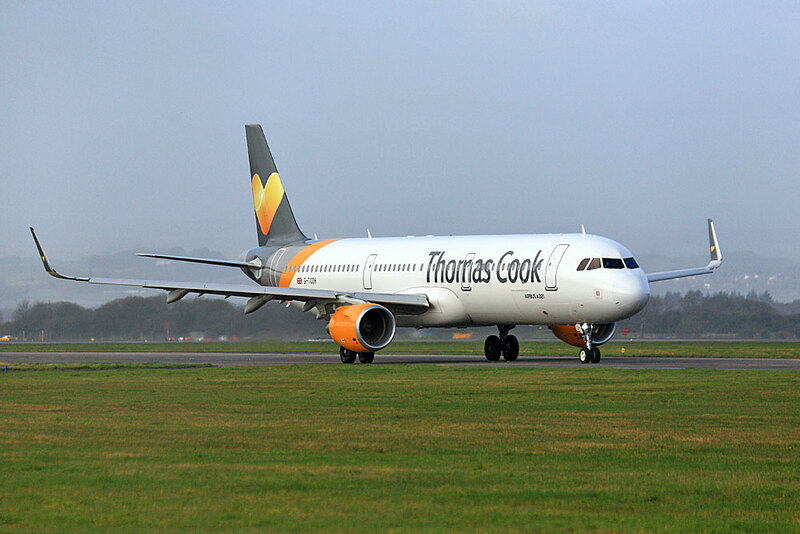 Despite high fuel costs and intense competition in the no-frills market, the airline continued to expand, adding new destinations including Prague, and additional locations in Spain to its network. 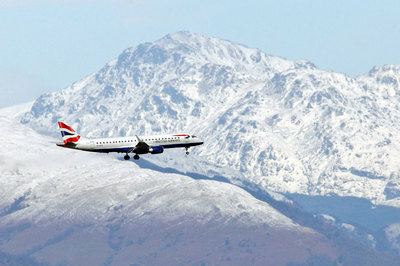 Long-haul flights to Canada and the USA, including Florida, from Scottish and English airports were also offered. 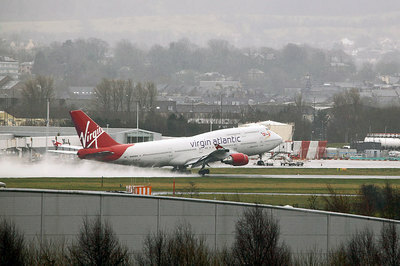 During the summer of 2007 there were flights to New York JFK and Boston from Knock Airport in Ireland. 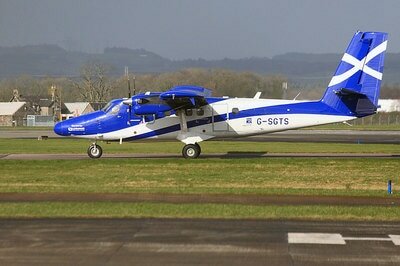 Flyglobespan also operated services to the Falkland Islands and Ascension Island on behalf of the UK Government. This was in support of the military and civilian population of those islands, and involved long-haul flights between RAF Brize Norton in Oxfordshire, RAF Ascension Island, and RAF Mount Pleasant on East Falkland. 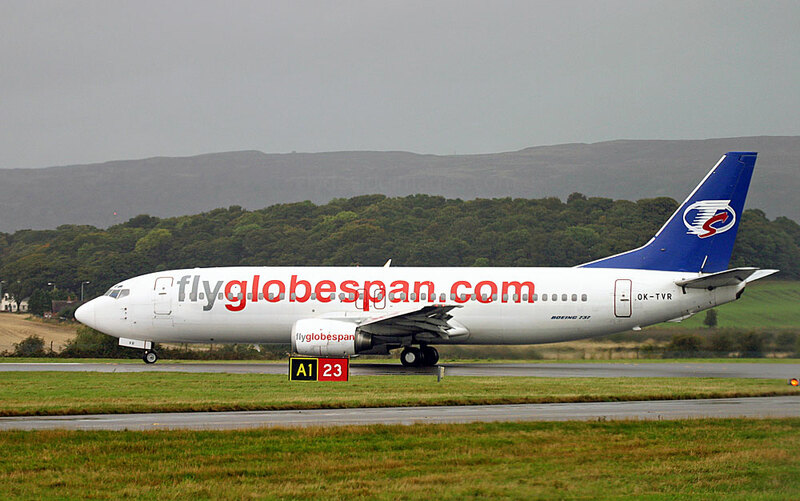 By November 2009 Flyglobespan was in severe financial difficulties mainly as a result of cash flow problems caused following delays in payment by credit card clearing company, E-Clear, with which the airline had an ongoing dispute. 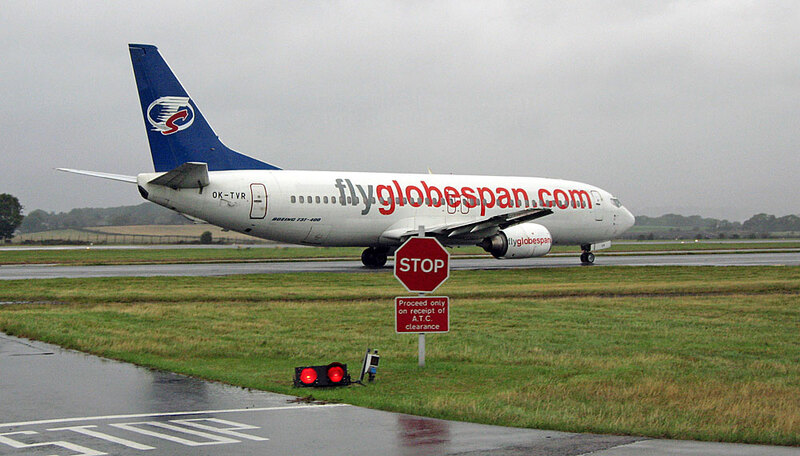 The Globespan Group PLC, Globespan Airways Ltd and agent Alba Ground Handling Ltd ceased operations on 16 December 2009 and were placed into administration. 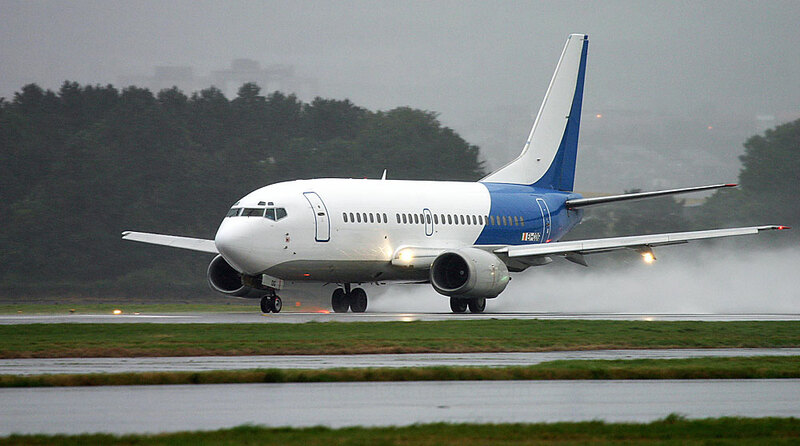 Manchester-based charter airline My Travel Airways began in 1990 as Airtours International. It started operations in March 1991, initially flying McDonnell Douglas MD-80 aircraft to destinations throughout Europe. 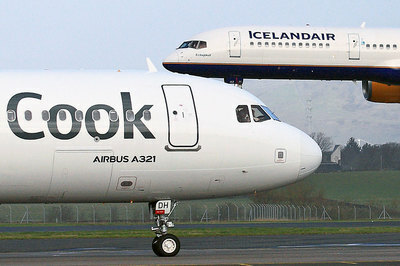 New aircraft types such as the Boeing 757 and Airbus A320 were acquired in the years that followed and the MD-80s were sold on. In 1996 the parent company also acquired Danish charter airline Premiair. 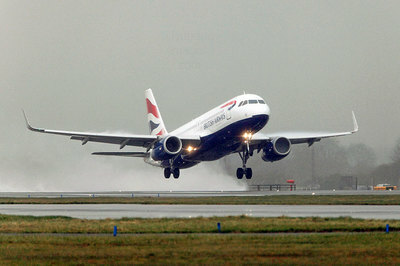 The addition of Boeing 767s and McDonnell Douglas DC-10s enabled the company to offer long-haul destinations in the Caribbean and the USA, with Florida proving especially popular with UK holidaymakers. 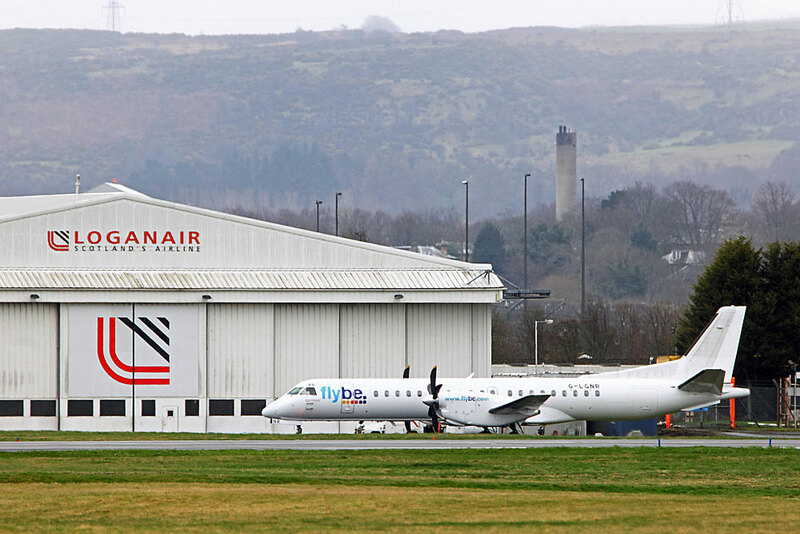 On 27 January 2002, an Airtours International aircraft became the first of any airline to use the new Swanwick Air Traffic Centre, as flight AIH550 from Las Palmas to Birmingham was handed over to the new facility. 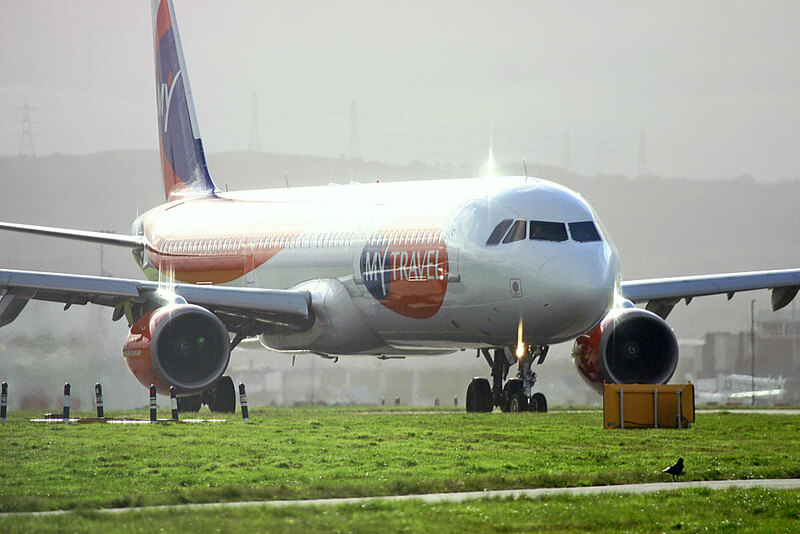 Following the renaming of the Airtours Group to the MyTravel Group in 2002, the Airtours International and Premiair operations were rebranded as MyTravel Airways. Another interesting snippet is that MyTravel was the last British airline to operate DC-10s. 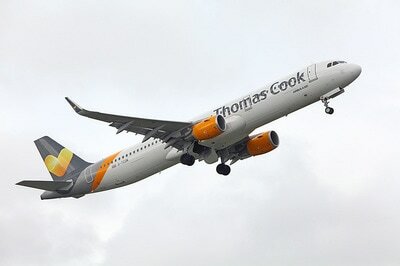 My Travel ceased operations on 30 March 2008 when it merged with Thomas Cook Airlines. 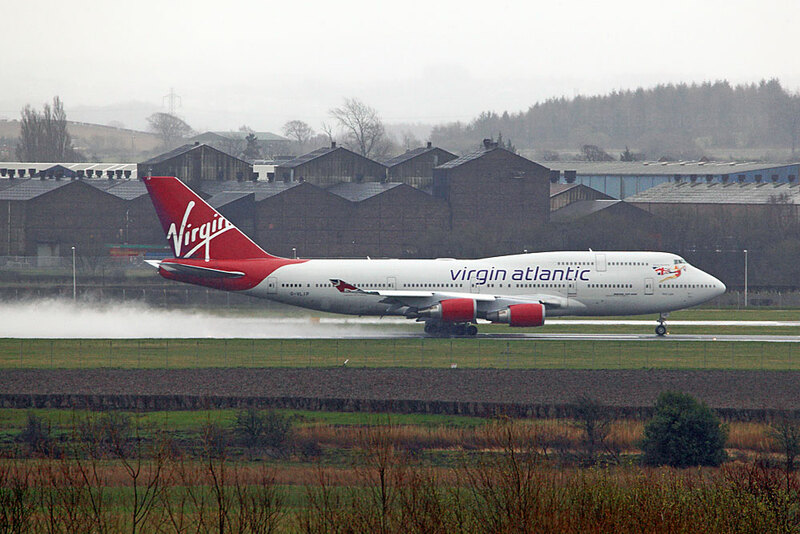 Nowadays, Travel City Direct offers package holidays to Florida flying with Virgin Atlantic Airways from Manchester, Glasgow, Heathrow and Gatwick to Orlando or Miami International Airports. Package holidays to the Caribbean including Cuba are also available. ​The company was established in 1992 and initially chartered flights from American Trans Air using Lockheed Tristars. 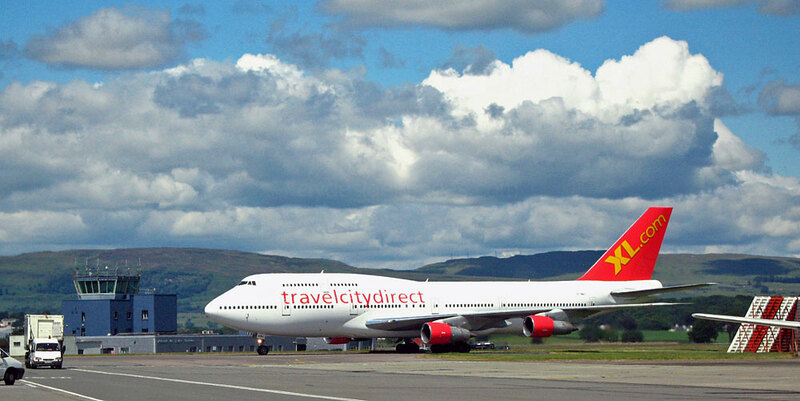 In 2002 Travel City Direct changed to a UK airline operator and began using former British Airways and Air Atlanta Europe Boeing 747s. 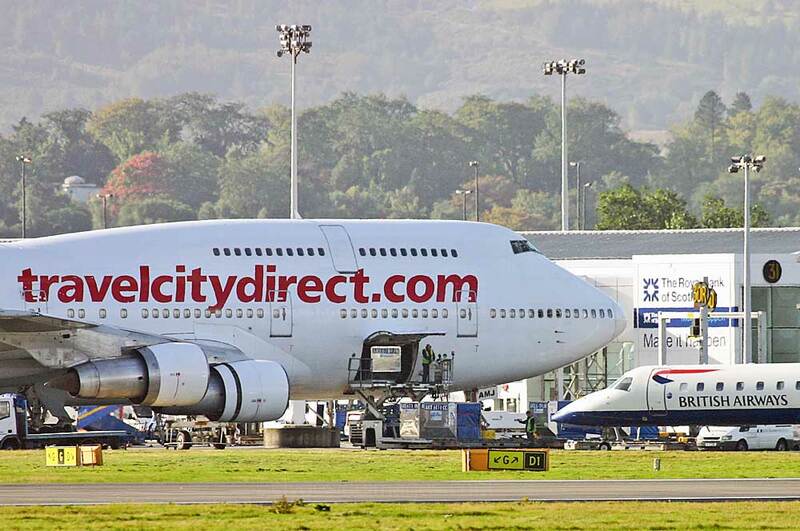 In March 2004, ​due to financial instabilities, Travel City switched all its flying to Air Atlanta Europe and branded all aircraft in the Travel City Direct livery. 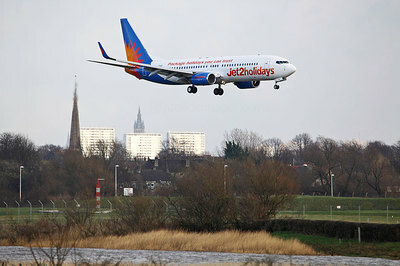 XL Airways, which was also part of Air Atlanta Icelandic, took over the operating of Air Atlanta Europe the following year. 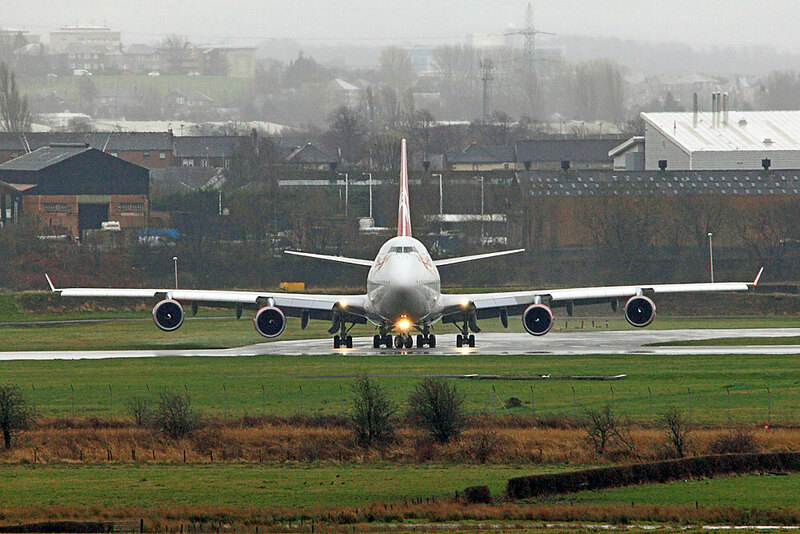 During the 2005 summer season XL Airways operated up to 16 flights a week to Orlando Sanford from Manchester and London Gatwick with additional departures from Glasgow International and Cardiff Airport using Air Atlanta Icelandic`s four Boeing 747 aircraft. Air Sal was an Italian company which did not have any aircraft of its own but leased BAe 146-200 / Avro RJ85 G-FLTD from Flightline (UK ) to begin charter operations, initially from Milan Malpensa airport in June 2005. 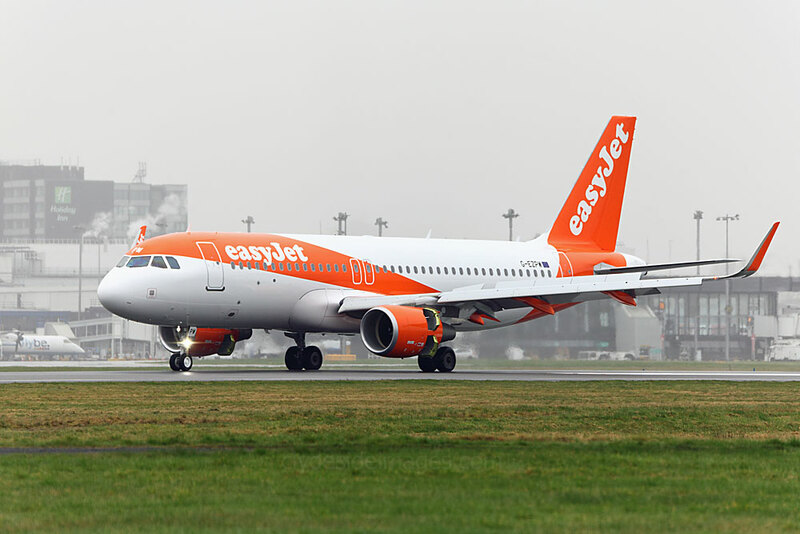 Routes between Salerno and various other Italian destinations were added, plus Brussels, Paris -Charles de Gaulle, Barcelona , Hahn (Frankfurt) and London (Stansted). 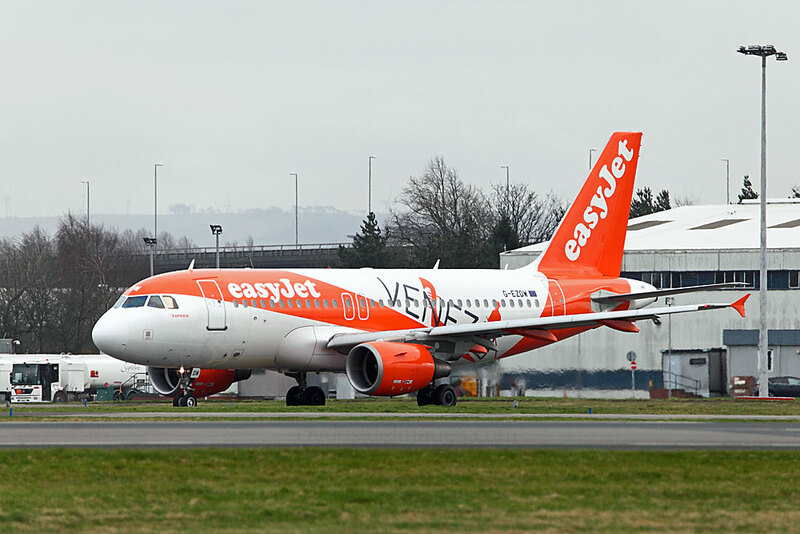 With its main base at Paris-Charles de Gaulle Airport, Blue Line, operated VIP flights and charter services for tour operators, as well as wet-lease contracts. It ceased operation on 6 October 2010, after being liquidated by the Tribunal de Commerce. ​The airliner pictured here with Blue Line titles has already had a busy career. It was originally delivered to Sterling Airways (Denmark) as PH-AHL in August 1990 and immediately leased to Air Holland. 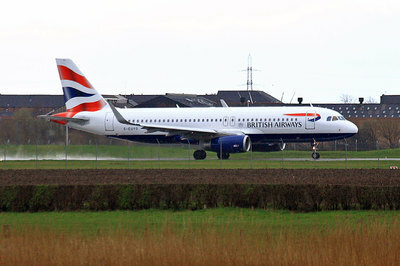 Thereafter, it was leased to Condor Flugdienst as D-ABNX. 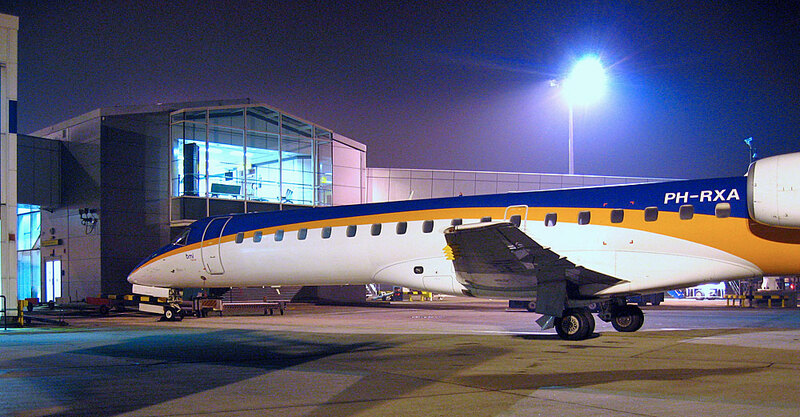 Condor bought it in Nov 1996 and in April 2000, following a period in storage at Frankfurt, it was leased to Icelandair Holidays as TF-FIW but immediately wet-leased to Condor for the summer season, returning to Iceland Air Holidays that September. 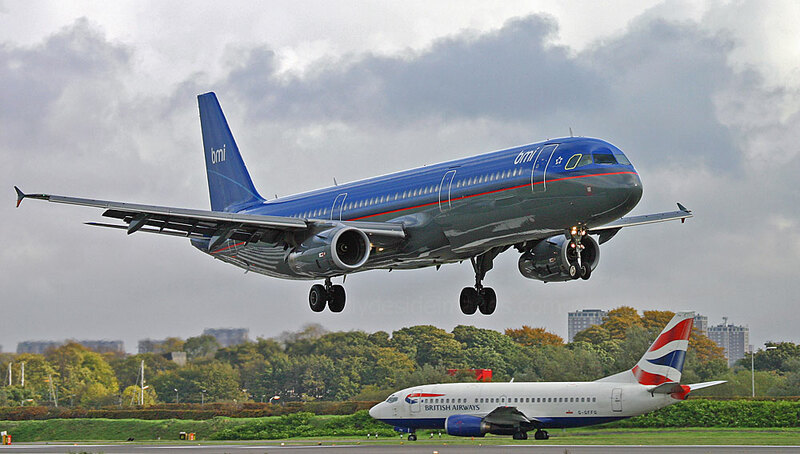 Over the years that followed, the aircraft was leased To Aeromar Airlines of Mexico, bmi British Midland, and in May 2005 the aircraft was leased to Blue Line (France) for the summer season. 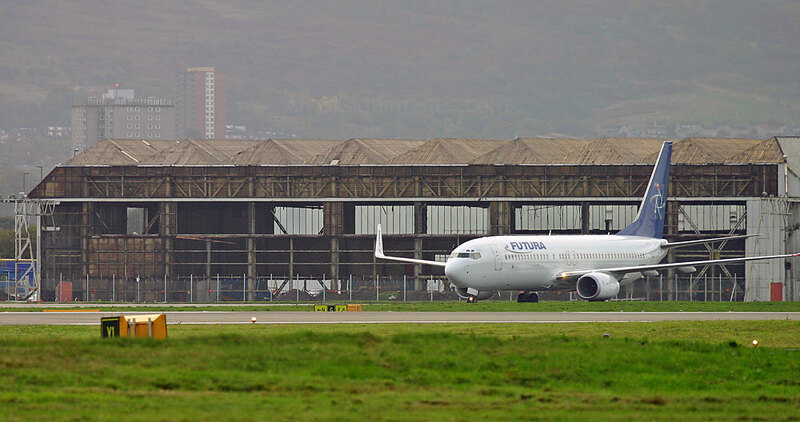 TF-FIW returned to Iceland that November and this shot was taken at Glasgow on the 13th of that month. The aircraft then had spells with Yakutia Airlines of Russia, Air Niugini (Papua New Guinea) and Air Salone which operated services between London-Gatwick and Freetown, Sierra Leone. It was back in action with Icelandair by March 2016. 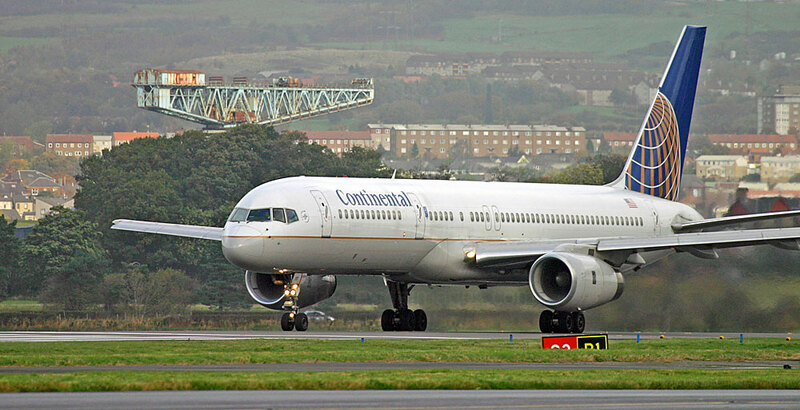 Continental Airlines was founded in 1934 and eventually headquartered in Houston, Texas. It began as one of the smaller carriers in the United States but grew into one of the country's largest. 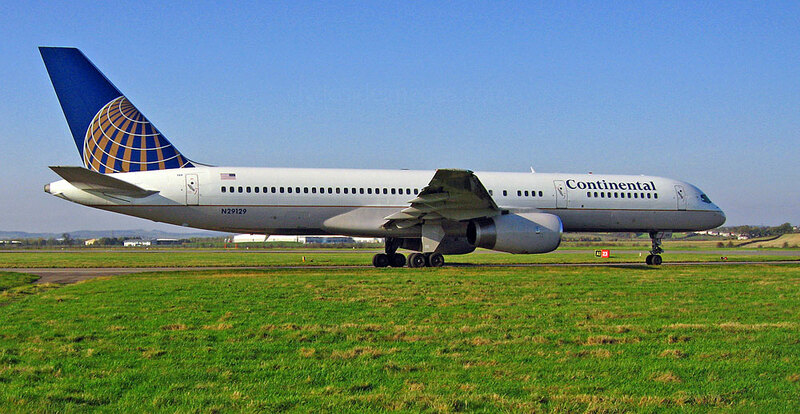 Despite facing financial troubles and other issues, Continental eventually became one of the more successful airlines in the US. In May 2010, the airline announced that it would merge with UAL Corporation, the parent company of United Airlines, via a stock swap. The acquisition was completed in October 2010, at which time the holding company was renamed United Continental Holdings. On 30 November 2011, all Continental flights began to use the "United" callsign in air traffic control communications which effectively marked the end of Continental Airlines. Continental`s abstract globe tail design is still used on aircraft in United`s fleet. ​Eurocypria Airlines Limited had its head office in Larnaca, with its main base at Larnaca International Airport and a secondary base at Paphos. Eurocypria became the first Cyprus-based charter airline when it was established in March 1992 as a wholly owned subsidiary of Cyprus Airways. 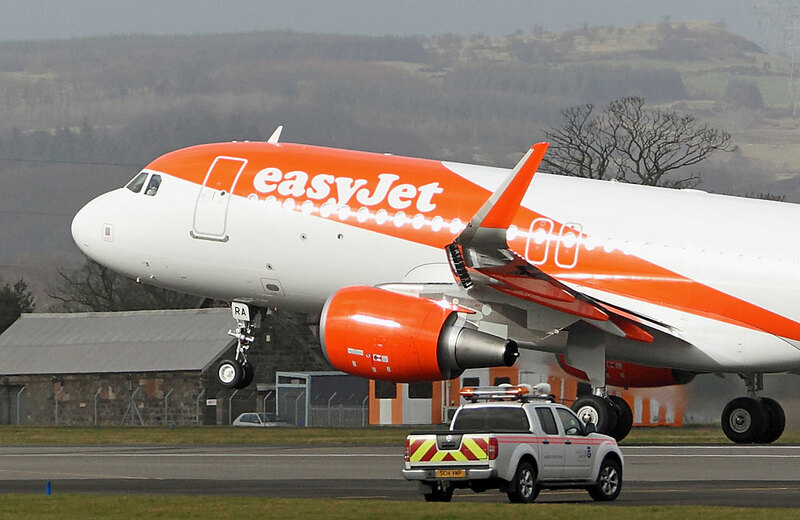 Operations began in June of that year with two new Airbus A320 aircraft. Two more were subsequently added and the airline operated both scheduled services from Cyprus, and charter flights. 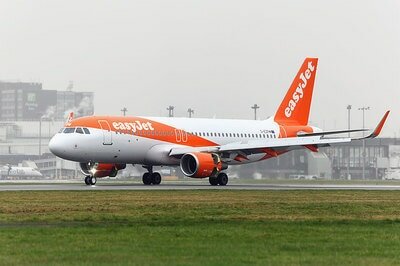 ​In 2003 Eurocypria replaced its Airbus fleet with four new Boeing 737-800(WL)s. Three of its former A320s were transferred to Cyprus Airways. 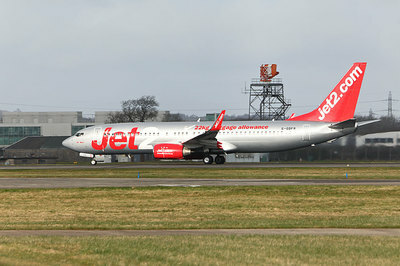 Eurocypria acquired a further two 737-800s in 2006. Eurocypria's aircraft were named after a wind and each featured a differently coloured tail fin. ​The approval of the cash injection met with heated legal wrangling, however, both in the Cypriot courts and with the European Commission. 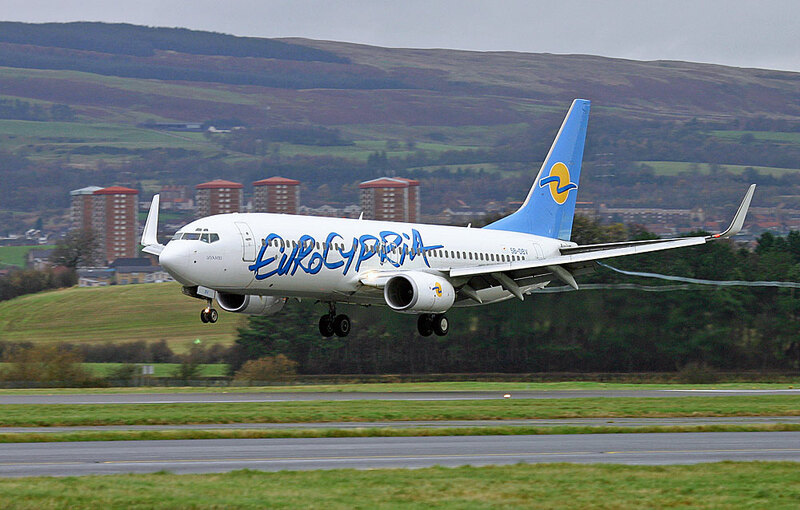 A possible merger between Cyprus Airways and Eurocypria to staunch the rapidly mounting losses was discounted and on 4 November 2010 it was announced that the airline would file for bankruptcy. All flights ceased by 13 November. 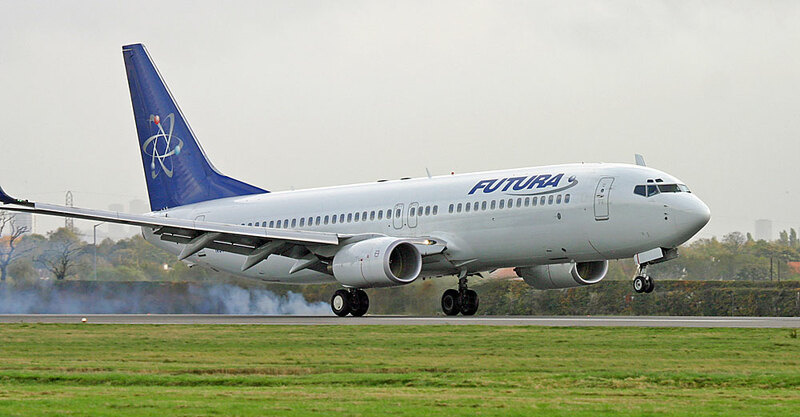 Spanish-based Futura International Airways which operated scheduled services and charter flights for tour operators and other airlines throughout Europe, as well as wet lease and ad hoc charters. 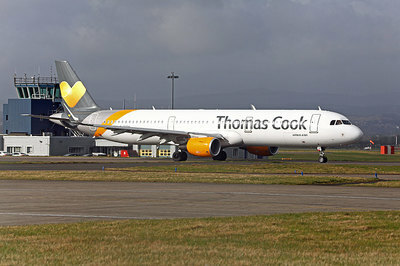 After failing to re-finance itself the company ceased trading on the 8 September 2008, leaving many passengers stranded abroad, mostly in Spain. 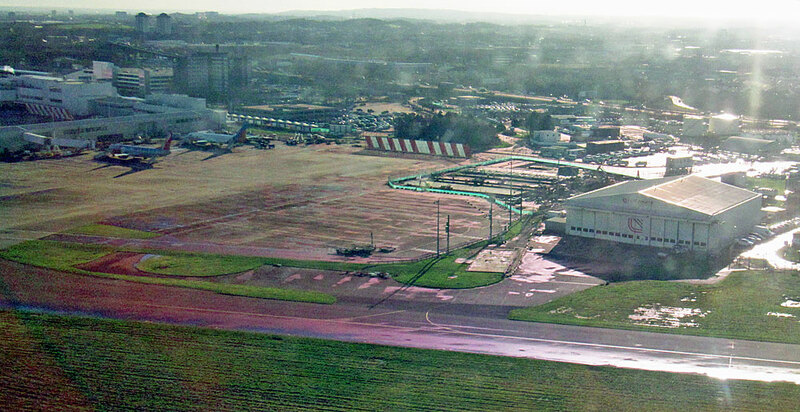 The shot below showing the original Loganair hangar being dismantled was taken in 2005. 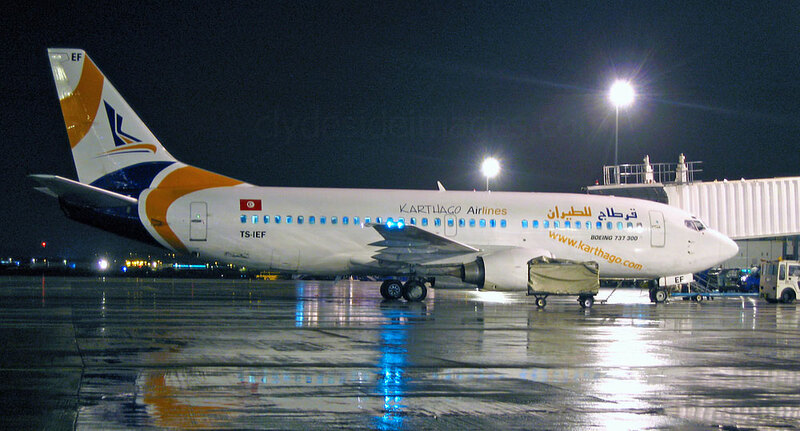 ​Karthago Airlines was a privately-owned airline based in Tunis, Tunisia, which operated scheduled charter flights to Europe. Its main base was Djerba-Zarzis Airport, but most of the flights were out of Tunis-Carthage International. 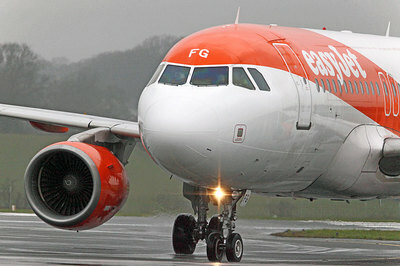 Established in 2001, the airline was owned by the Karthago Group and various banks, insurers and tour trade investors. The same company had a stake in KoralBlue, an Egyptian airline which which was based at Sharm el-Sheikh International Airport. 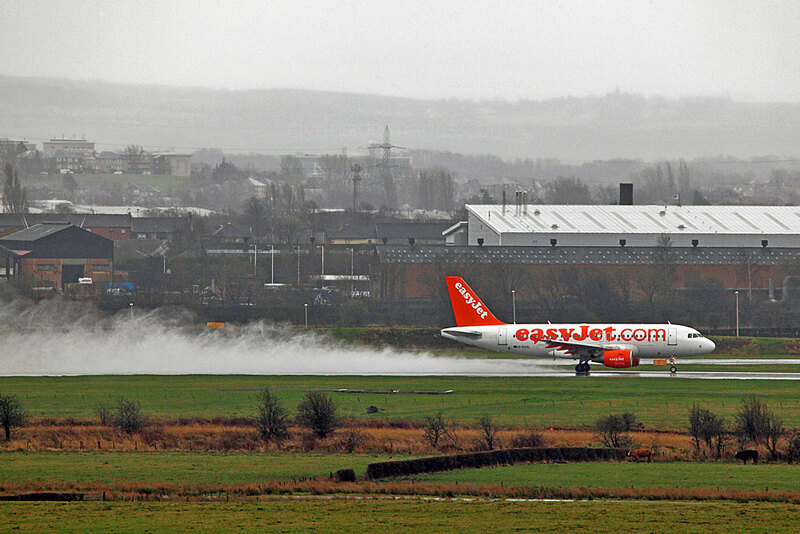 Boeing 737-3Q8 TS-IEF visited Glasgow in late October 2005. I don`t know whether any of this Russian airline`s planes ever flew in to Glasgow, however, this shot, which was taken in September 2005, shows Aer Lingus 737-548 EI-CDG which operated for much of the summer that year in a half-finished Pulkovo livery! 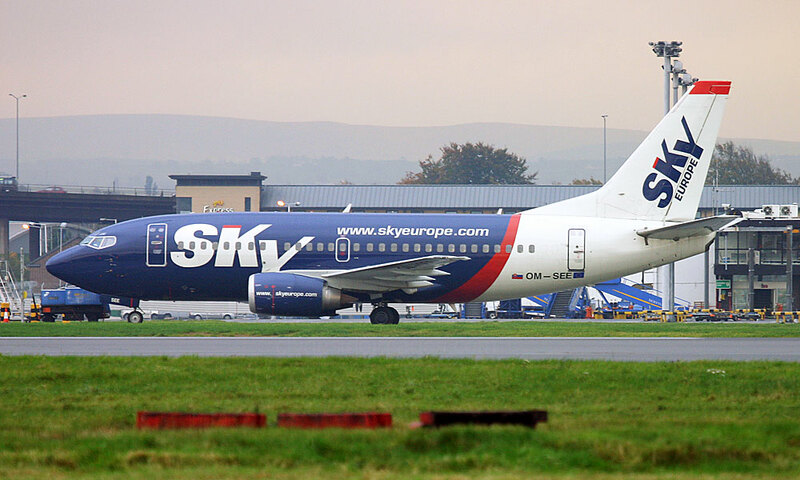 This was one of several of the Irish national carrier`s 737s which were acquired by Pulkovo Aviation Enterprise, an airline with its HQ at Pulkovo Airport which serves Saint Petersburg. 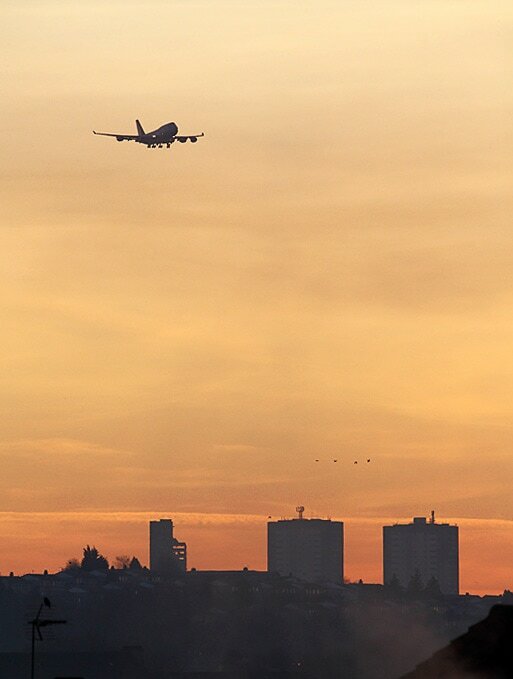 ​Pulkovo, which was the third largest airline in Russia, was 100% state owned. On 29 October 2006 it completed a merger with government-owned Federal State Unified Aviation Service Company to form Rossiya Airlines. 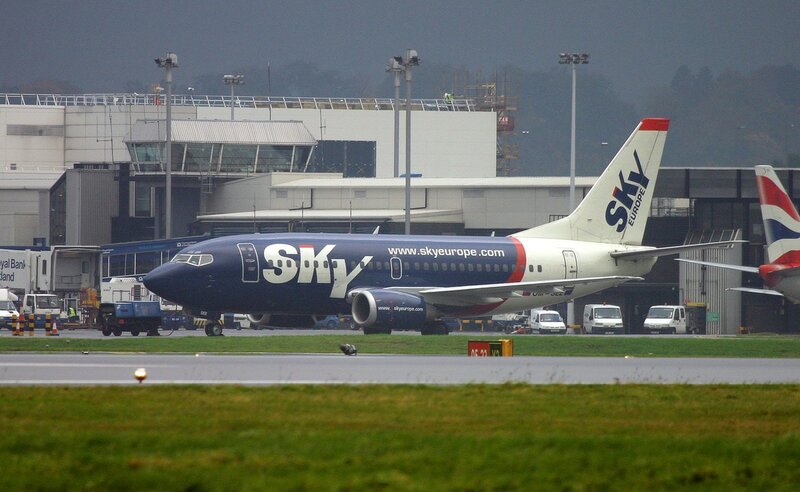 ​SkyEurope Airlines was created to compete with low-cost companies which based in Western Europe such as easyJet and Ryanair. SkyEurope had its HQ in Bratislava, Slovakia, and another base in Prague. The airline offered short-haul scheduled and charter passenger services from February 2002 but never managed to make a profit and by August 2009 it was forced to file for bankruptcy. 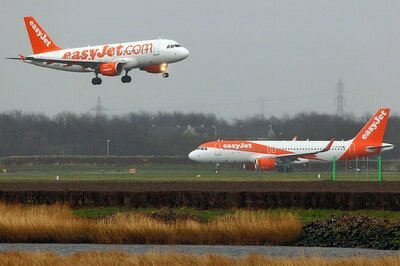 At that time the fleet consisted of 13 Boeing 737s. 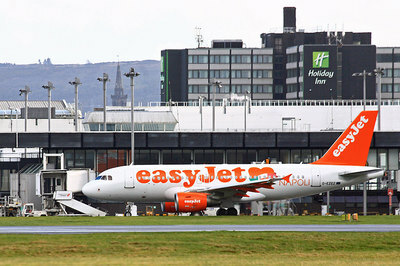 All flights ceased on 1 September 2009 after which Ryanair, Malev Hungarian, Wizz Air and Blue Air all offered cheap one-way tickets to assist stranded passengers. 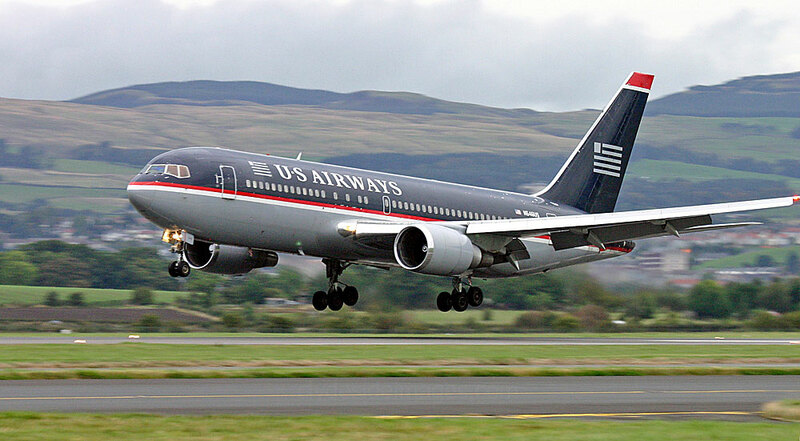 ​US Airways (formerly known as USAir) traces its origin to All American Aviation Inc, a company founded by in 1939 and headquartered in Pittsburgh, Pennsylvania. This airline initially served the Ohio River valley, delivering mostly mail. In 1949 the company was renamed All American Airways, and then Allegheny Airlines in 1953. Over the next 20 years Allegheny became one of the largest carriers in the northeastern United States, changing its name to USAir in 1979. In early 2013, American Airlines and US Airways announced plans to merge, creating the largest airline in the world. By that time US Airways alone employed around 32,300 people worldwide and operated 3,028 daily flights. On April 8, 2015, the FAA officially granted a single operating certificate for both airlines, marking the end of US Airways as an independent carrier. The brand continued to exist until October of that year. Volar Airlines was based in Palma, Spain, and was the successor to LTE International Airways which was established in April 1987, the founding shareholders being Spanish businessmen and the privately owned German airline LTU. From 1993 until May 2001, LTU was the sole owner having bought out the other original shareholders. 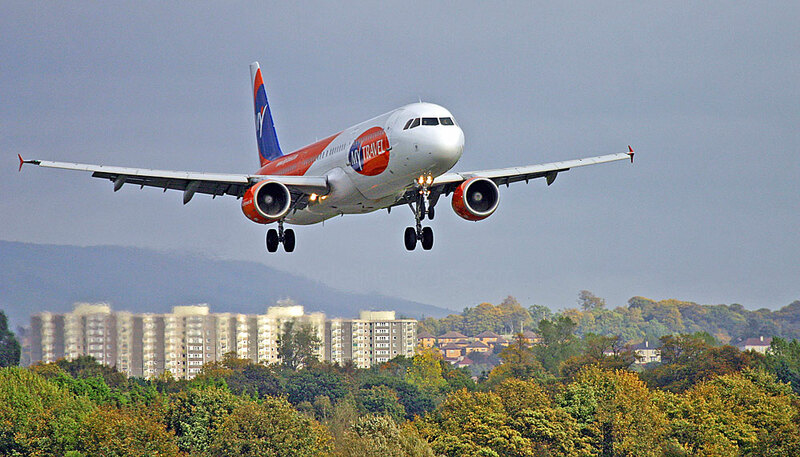 In May 2001 LTU sold the airline to a group of Spanish and Italian businessmen, including the Volare Group, which resulted in the airline being rebranded as Volar Airlines. 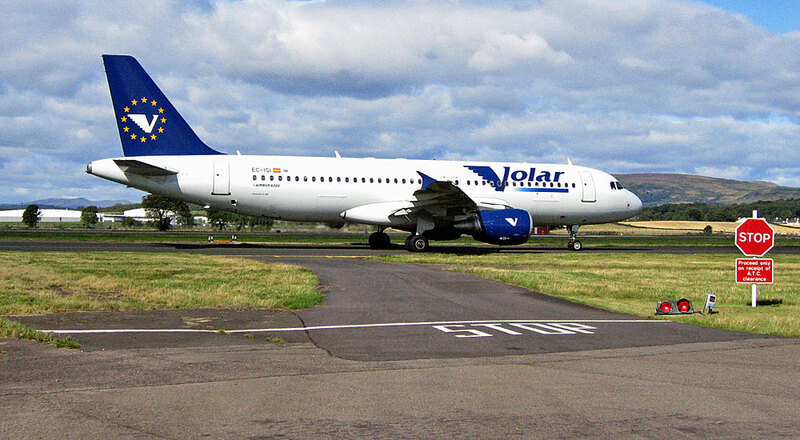 In May 2005, the Volar Airlines fleet consisted of two Airbus A320-200s, three A321-200s and one Boeing 757-200. 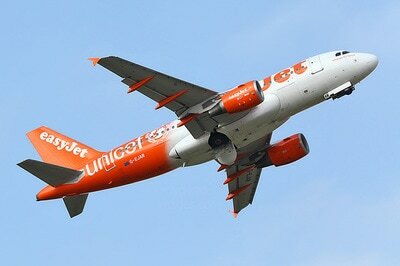 Later the same year, the airline`s name reverted to LTE International Airways. 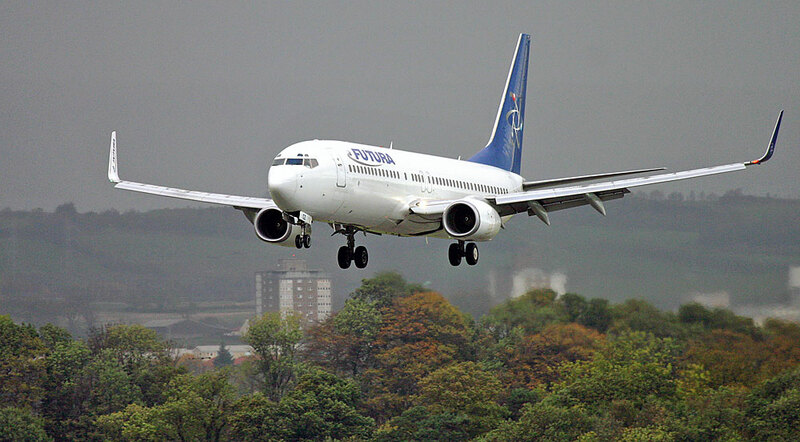 I must admit to being among the thousands of Glasgow `Zoomers` who headed to Canada on one of this Canadian low-cost airline`s distinctive blue and white coloured jets. Zoom Airlines was founded in May 2002, by two Scottish brothers, John and Hugh Boyle, to fill a gap in the Canadian leisure travel market. The Boyle`s had entered the holiday business in the 1980s, creating Falcon Holidays in their native Scotland, which they later sold for a large profit to a major UK tour operator. Their next venture, Direct Holidays, was started in 1991 and eventually sold to the MyTravel Group for £84m after which Hugh relocated to Canada. Based in Ottawa, the country`s capital, Zoom operated year-round scheduled services to Europe, and charter services to South America, the Caribbean, and the Southern United States. In the summer of 2006, John Boyle founded a sister company in the UK known as Zoom Airlines Limited. 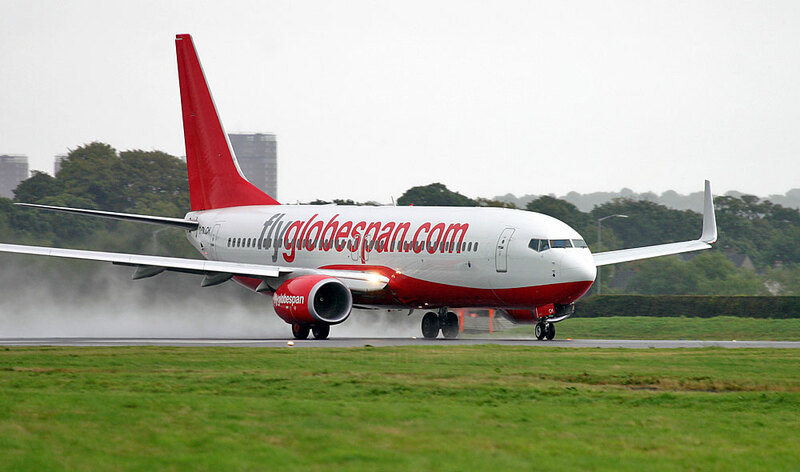 During the 2006 / 2007 winter season, Zoom Airlines and Flyglobespan.com embarked on a code-share agreement after which the latter airline introduced its own Canadian program. By August 2008, the high cost of aviation fuel, along with the world economic downturn had taken their toll on the company`s finances. 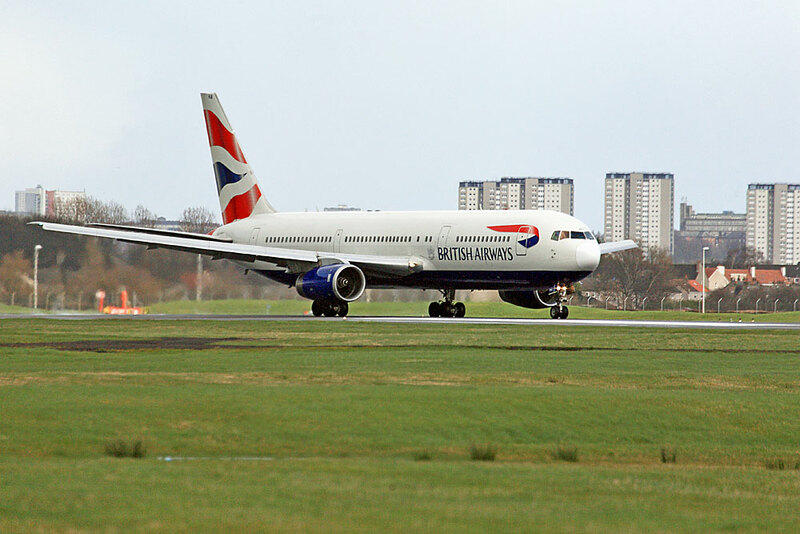 An aircraft leased to Zoom was grounded at Calgary International Airport when the owner cancelled the lease agreement and another, a Boeing 757, was impounded at Glasgow International because of non-payment of landing charges. Zoom was forced to cease all operations and filed for bankruptcy protection later that same month.